Happy Life Adventures | Join us for the adventure of our life! It’s amazing to contemplate that over 25% of Costa Rica is set aside as national parks, reserves, wetlands, other protected natural areas. That’s the highest percentage of any country in the world! Parque Nacional Cahuita is one of the lesser known national parks in Costa Rica. Established in 1970 to protect the coral reef just offshore, its 2,635 acres protect five different habitats: beach, mangrove, margin/edge, marine and tropical rainforest-lowland. 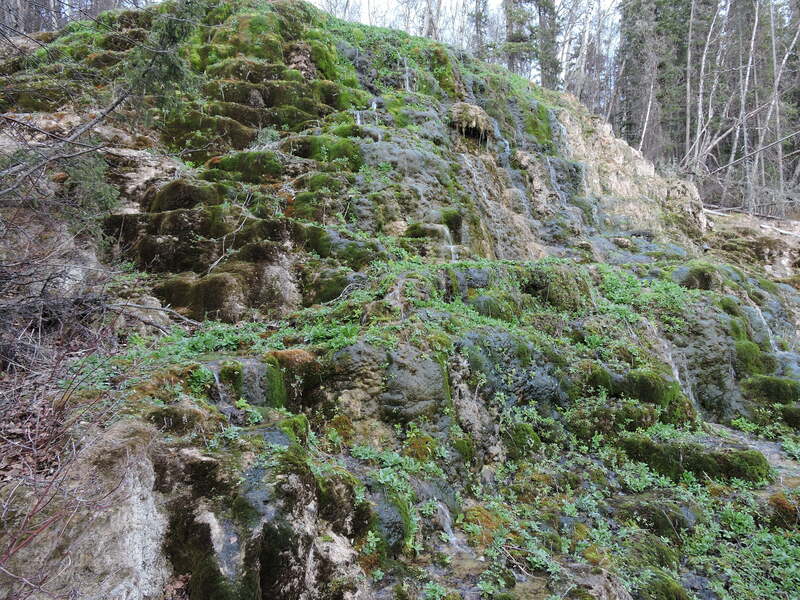 And most of those habitats can be experienced by hiking 8.2 km trail between the two park entrances. We start at the Puerto Vargas entrance, just a 10 minute walk from the house where we’re staying. We arrive right when the gates open at 8:00 am. We see some new birds – Black-Chested Jays and a Band-Backed Wren – and a large Golden Orb spider on its web before we ever enter the park. Entrance is $5 per person. We tell the park ranger about our plan to walk the entire trail through the park to the other entrance in the town of Cahuita; she suggests that we start with the 2.1 km boardwalk. We’re completely enchanted with the experience of being immersed in the rain forest as we walk slowly along the boardwalk. We see more birds (including a Purple-throated Fruitcrow and a Keel-billed Toucan), a huge variety of plant life & fungi, more Golden Orb spiders, frogs, and an Emerald Basilisk. We watch a small lizard hunting and then catching & eating a little white worm. The background sounds are the ubiquitous Howler monkeys and the crashing of the waves on the offshore reef, reminding us that we’re not that far from the ocean. We take our time – there’s so much to see! – so it takes us about two hours to cover the entire boardwalk. Fungi seen from the boardwalk – and notice the little frog on the upper-right mushroom! The rain holds off until we reach the end of the boardwalk. We take a short break and watch a Crab-Eating Raccoon saunter across the parking lot. Then we start the second part of our hike on the trail along the shore. Crab-Eating Raccoon saunters across the parking lot. At first, the rain isn’t too bad and actually cools us off. Mike dons his rain poncho and we put the camera away in his backpack (protected by the poncho) so it doesn’t get too wet. All the photos along the shoreline part of the trail are taken with our phones. The birds largely disappear when it starts raining but we do see a group of Magnificent Frigatebirds perched on old pilings to wait out the rain, and a couple of Royal Terns. We also see several Hermit Crabs, one large one and one much smaller one, and two very venomous snakes: the small yellow Eyelash Viper and the larger brown Rainforest Hognosed Pit Viper. Neither of these snakes are bothering anybody, just hanging out in their tree. We make sure to keep a safe distance while we observe them. The trail is largely hard-packed sand and the views of the beach are very pretty with the waves crashing on the coral reef about 150-200 yards offshore. We pass Punta Vargas and then we have a water crossing through the tanin-stained Rio Perezoso (Sloth River) – the water is surprisingly warm and where we cross, just over our ankles – before we get to Punta Cahuita (about two-thirds of the way to the Cahuita park entrance). At this point, the trail deteriorates into a muddy mess. We have to slog with ankle deep mud in some places where there’s no way around it. I’m wearing hiking sandals so my feet get covered in mud; Mike just does his best to get as little mud on his shoes as possible. There’s another, deeper water crossing through the Rio Suarez that washes our feet clean but we’re soon muddy again as we continue hiking. We’re not sure if the trail is so muddy because it’s been raining or if it’s always this way, but I’m already tired from the hike so far and it’s a struggle. It’s such a relief when we reach another boardwalk (more dilapidated than the first one) and can make better time. When the boardwalk ends, we decide to walk along the beach rather than the trail because of the mud. 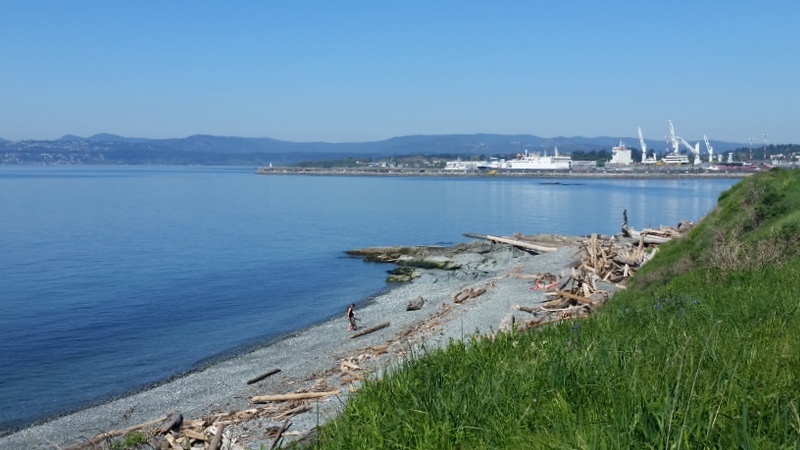 There are lots of people enjoying a day at the beach – picnicking, sitting in one of the many shelters, or playing in the water – in spite of the rain. 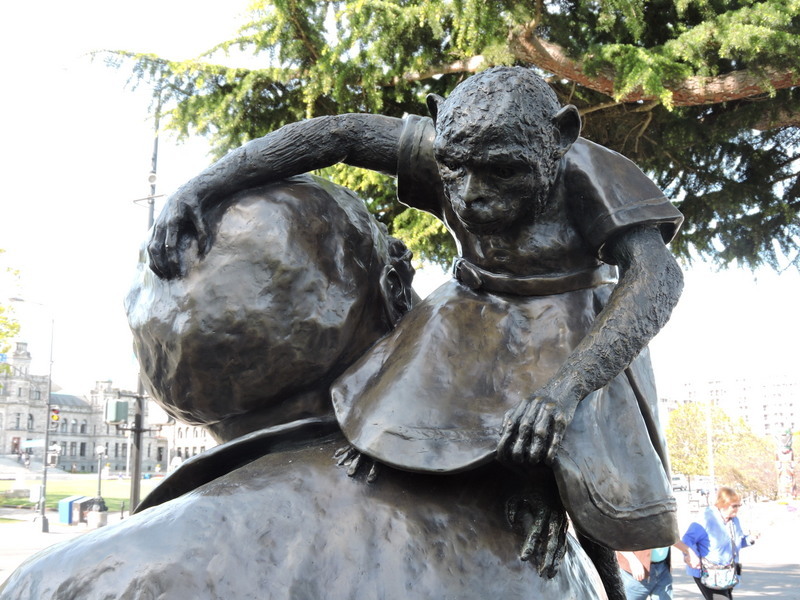 Howler and Capuchin monkeys make their ways through the trees around us. Finally, we take the trail again to reach the national park entrance in the town of Cahuita at about 2:00 pm, six hours after we started hiking. We all agree that we enjoyed the first two-thirds of the hike much more than the last third! But it was an adventure that I wouldn’t have missed for the world. This entry was posted in Central America, Costa Rica and tagged Birds, hiking, national park, wildlife on March 13, 2018 by admin. It’s an overcast morning when we wake up but the birds are still singing in the trees. After breakfast, we walk to the hot springs for one last soak before we get back on the road. 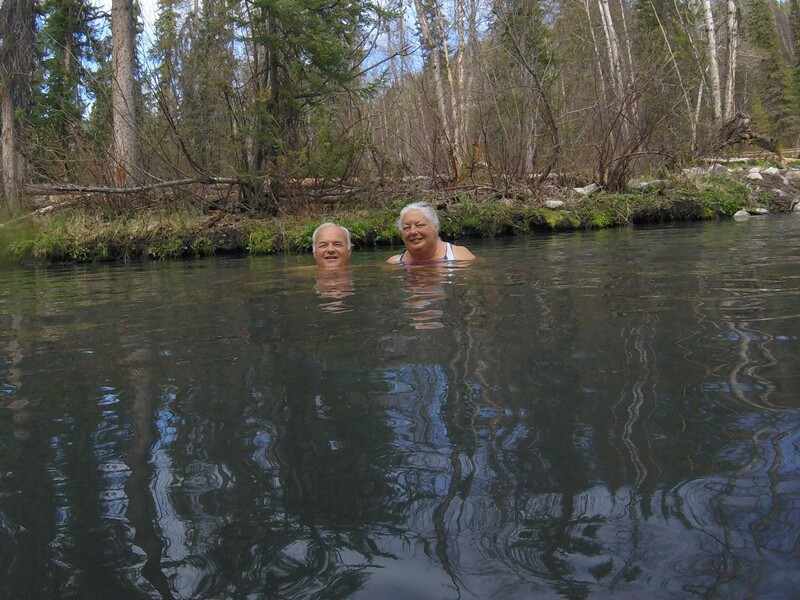 We enjoy another nice walk through the wetland and the forest, a lovely relaxing soak in the hot pool, and then the cool pool, and then finish up in the hot pool. People come and go, and sometimes Mike & I have a pool all to ourselves, which is magical. We don’t so much talk to other people as we listen to the conversations around us. One couple is traveling from Georgia to their home in Alaska, 140 miles from Haines Junction. They have property on a lake there that the moose like to use for calving. Another couple discusses local music festivals with them. They’d like to go to the Haines Fair but they can’t make it because it’s at the end of July and that’s when sheep hunting season opens. 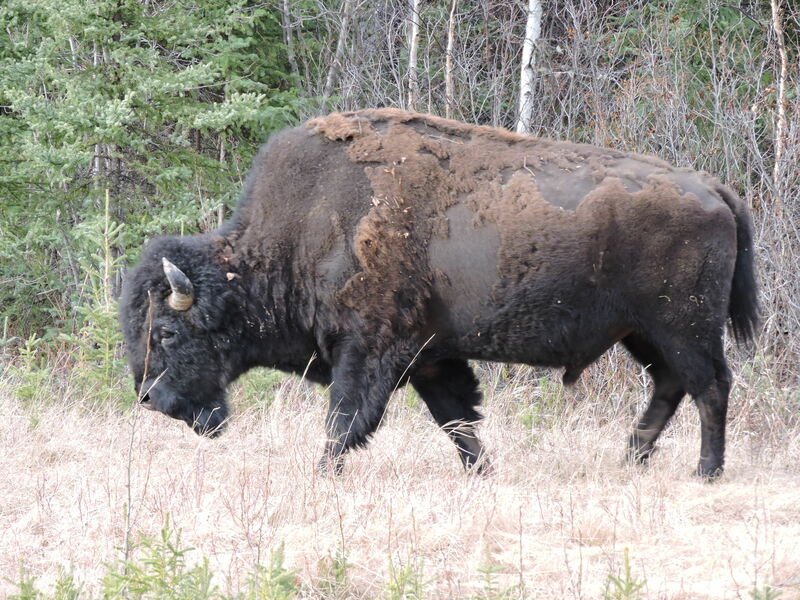 A man tells us that when he drove the opposite direction on the Alaska Highway last week, there were no Wood Bison calves; they must have been born this week. We reluctantly get out of the hot springs and walk back to the RV on the boardwalk. The day is now warm and sunny, and we see several colorful butterflies and hear a woodpecker. 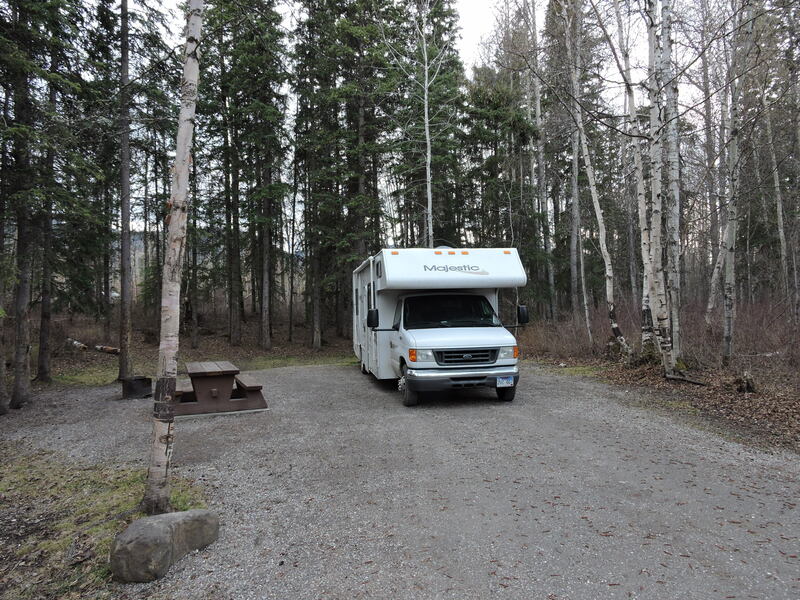 It has really been a relaxing couple of days here at Liard River Hot Springs at our campsite with no electricity, let alone cell phone connectivity or the Internet. Nothing to do but observe nature, soak in the hot spring, and enjoy each other’s company. We get the RV ready for travel and we back driving west on the Alaska Hwy by noon. This time we don’t see any Wood Bison on the side of the road around the campground entrance, but we do see a lot of piles of Wood Bison poop! We had planned to eat lunch at the Coal River Lodge, which The Milepost pronounces has “good bison burgers” (that seemed appropriate for some reason), but it’s still closed for the season. This is a common problem traveling on the Alaska Highway in late April or early May. Many restaurants, campgrounds, and gas stations have signs: “Closed until May 15” or even later. Eventually, we stop at a viewpoint overlooking the Liard River rapids. We enjoy the beautiful view while we eat tuna sandwiches for lunch. It starts to rain after lunch. We stop for gas in the tiny town of Contact Creek, which is still in British Columbia. We’ve been told that gas is cheaper here than in Watson Lake, which is in the Yukon Territories, and in fact, CN$0.999/liter is a good price. I take a little walk in the rain while Mike gets the gas and take a photo of a sign that says “Welcome to Yukon, even though we’re really not in Yukon yet. There’s no cell phone connectivity; I can hear the telltale sound of a generator running to provide electricity. As we continue to drive, we see five male magnificent Wood Bison grazing on the side of the road. 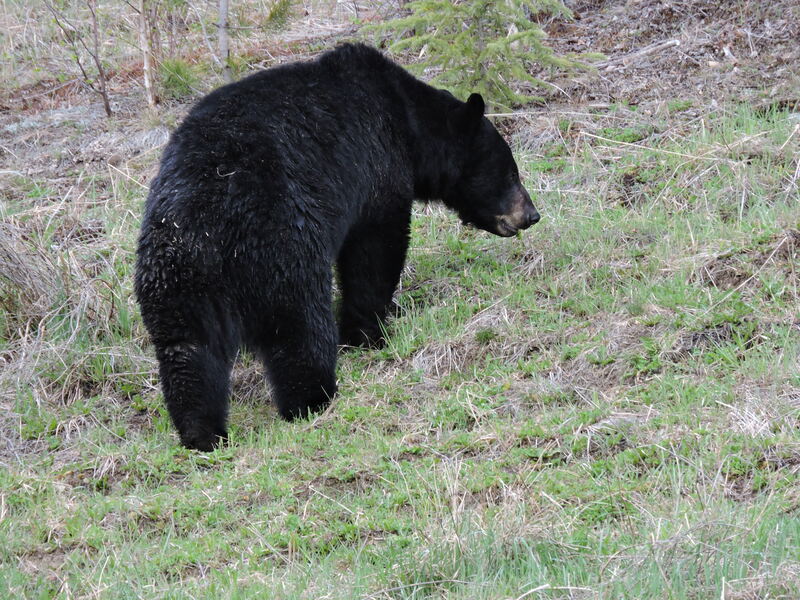 Then, just a few minutes later, we see a Black Bear eating grass & leaves. Then we see more Wood Bison, this time grazing on the opposite side of the highway. We pull over to watch them and they walk within feet of the RV. It’s sunny and there’s just a few puffy white clouds in the sky by 3:30 pm when we cross from British Columbia into the Yukon Territories. The only “Welcome” sign is for travelers entering B.C. The “Welcome to Yukon” sign is a few kilometers further across from Lucky Lake. The Alaska Highway becomes Yukon Hwy 1. Watson Lake, population 1,563, is known as the “Gateway to the Yukon”. We stop to walk around the Signpost Forest, a little piece of land along the Alaska Highway where literally thousands of town signs are posted by those traveling along the Alaska Highway. Mike & I discuss the possibility of stopping in Watson Lake for the night but since we got a late start from Liard Hot Springs, we decide to continue driving for a few more hours. At 5:00 pm we pass the 1,000 km Alaska Highway signpost. Everywhere there’s an embankment along this stretch of highway, people have used stones to spell out their names, messages, or designs. We continue on to Rancheria Falls Recreation Area. Our first Yukon Park! 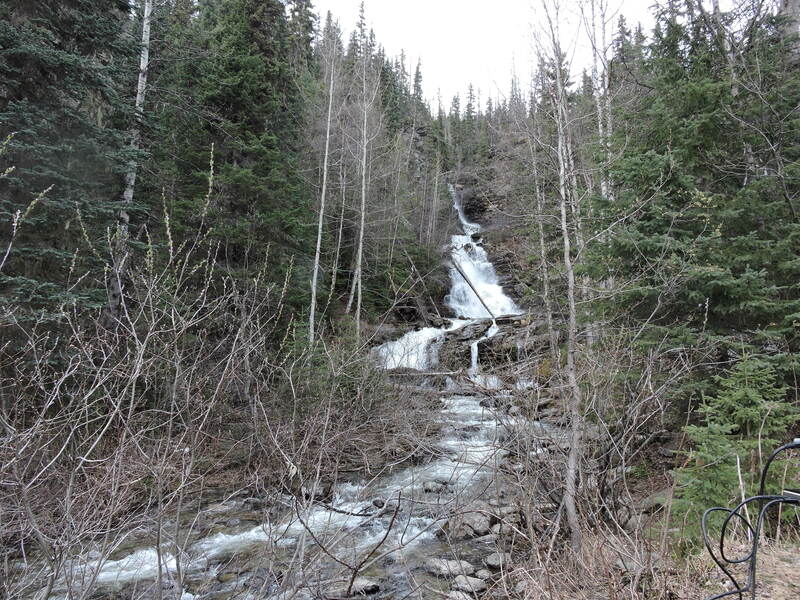 We take a lovely ten-minute walk, first on a gravel trail through the boreal forest and then on a boardwalk over the rocks to see two picturesque falls on the Rancheria River. The trail is the perfect length to walk to get our blood flowing after we’ve been driving for a while. We return to the RV energized to drive some more before it gets dark. Mike brings the bear spray “just in case” but the only wildlife we see us a reddish-brown squirrel. We continue driving west on the Alaska Highway and cross the Continental Divide. Here it divides two of the largest river drainage systems in North America: the Yukon River & the McKenzie River watersheds. 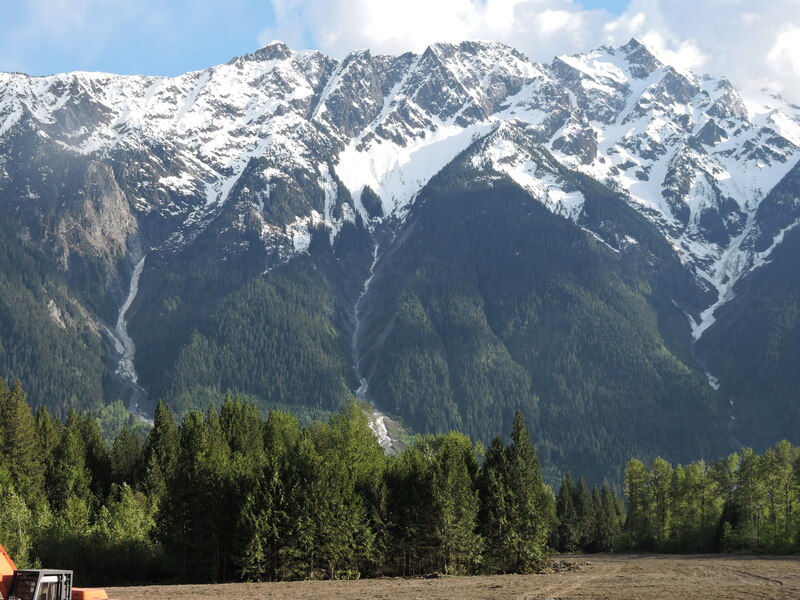 We enjoy fantastic views of the dark, snow-covered Cassiar Mountains. Then just after 7:00 pm, we see the sign “Welcome to British Columbia”! It turns out that the Alaska Highway travels through B.C. starting here for about 42 miles before it returns to Yukon. We pass pretty Swan Lake, covered in ice. It’s raining off and on, and the sun is behind the clouds, making dark earlier this evening. Even when it’s not raining, the highway is wet, keeping our speed down. Dark clouds hide the sun, which is actually a blessing since it’s not shining directly in our eyes as we continue to drive west. At 8:00 pm we leave British Columbia for the last time and re-enter Yukon. According to The Milepost, we’ve done this seven times this afternoon but it hasn’t always been marked. At 8:30 we arrive in Teslin, population 450, mostly First Nation Tlingit people. We pause to take in the view of the Nisutlin Bay Bridge at sunset and then cross the bridge (the longest water span at 1,917 feet on the Alaska Highway). and turn into Yukon Motel & Lakeshore RV Park. We turn into Yukon Motel & Lakeshore RV Park, find a vacant site, and go to the restaurant to pay for it. It turns out that they’re still serving dinner. The cook comes out of the kitchen and announces that she has just two plates left of tonight’s special: meatloaf & mashed potatoes with gravy, carrots, and a fresh green salad. Do we want them? Yes! Mike & I enjoy a delicious home-cooked dinner, everything freshly prepared and well worth the price. The helping of meatloaf is huge – I have to give Mike half of mine (and he eats it all). This entry was posted in Alaska Journey, Canada on October 28, 2016 by admin. As we drink our morning coffee, we watch a female Wood Bison and her calf wander through our site. Wow – I’m so surprised that I forget all about my camera! We can’t wait to go soak in the hot springs but first, we have to walk across the street to the commercial campground to get change so we can pay for another night at Liard River Hot Springs. They have a small convenience store but there isn’t much to buy. I finally end up buying a large jar of very expensive (CN$9.99) peanut butter. A herd of Wood Bison is hanging out by the side of the road next to the convenience store parking lot. Mike and I walk back to the RV through the woods to drop off my camera & the peanut butter, and then we walk up to the front entrance kiosk to pay for another night of camping. We discover that prices for camping increased on May 1 from CN$16.00 to CN$26.00! We put CN$16.00 in the envelope and hope for the best – we haven’t seen any sign of park rangers or employees since we got here. At 11:30 we’re finally able to walk over to the boardwalk and to the hot springs for our soak. Bird watching is excellent as we walk on the boardwalk that takes us through the wetland to the hot springs. We see fat American Robins, Canada Geese, Rusty Blackbirds, Pine Siskins, White-Browed Sparrows, and Greater & Lesser Yellowlegs. We check out the hot springs, two pools with stairs and handrails to make it easy to get in and out, and changing rooms/toilets. There’s a strong smell of sulfur. 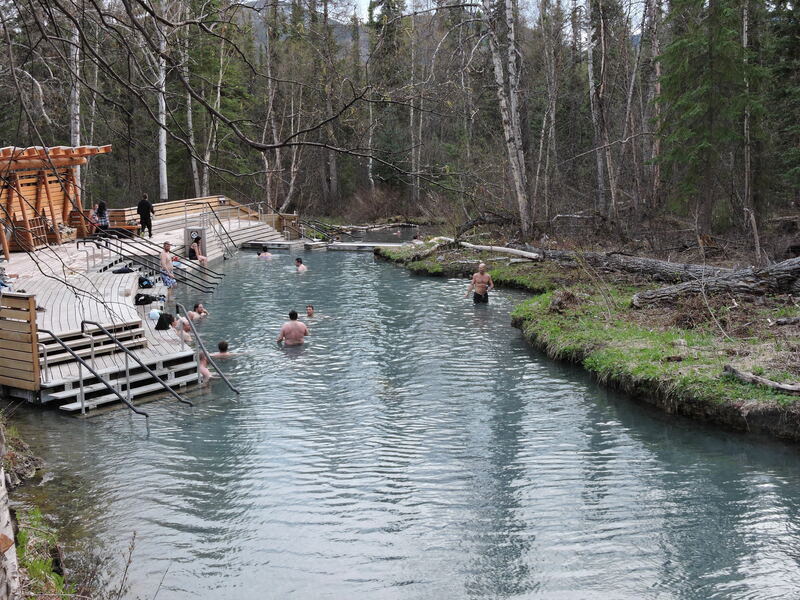 There are about twenty people soaking in the hot springs, so it certainly isn’t very crowded. We go in the lower pool first, since it’s cooler. It’s so pleasant to float around the natural pool, drifting through warm & cool (but never cold) areas. Once we’re acclimated, we go in the hotter upper pool. It’s a little too hot for Mike but it’s perfect for me. The closer one gets to the end of this pool (where the hot water flows in), the hotter it gets. I venture close to the end but it gets too hot even for me. We spent at least an hour soaking in this pool, getting out occasionally to sit on a bench & cool off and then going back in. At about 1:00 pm the mosquitos start to bother us and we’re hungry so we decide to go back to the RV. Walking back from the hot springs along the boardwalk, we see a couple of Lesser Yellowlegs in the wetland. After lunch, we walk back to the hot springs for another soak. 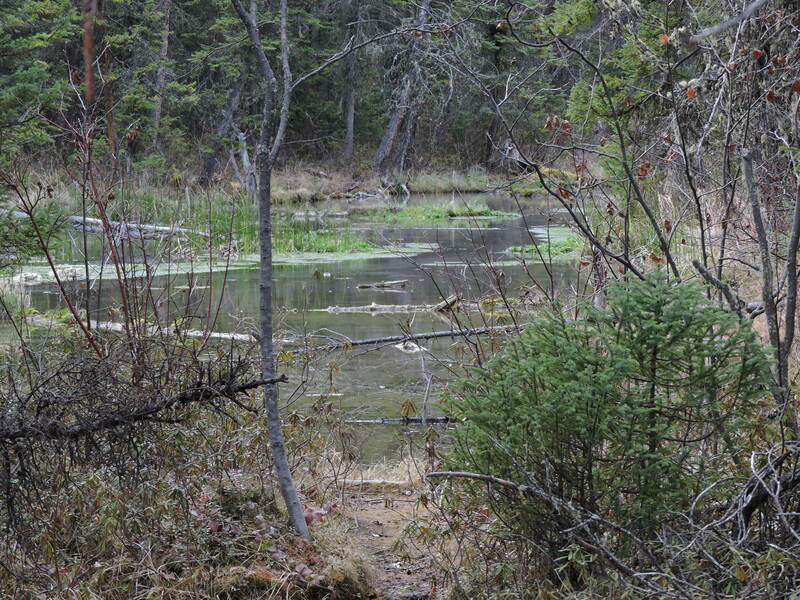 This time we see a moose grazing in a pond just off the boardwalk. We soak for another hour and a half, chatting with interesting people who are soaking too. We talk to a man who rebuilds old boats in Victoria, lives in the Yukon, and is driving back from Cabo San Lucas. Another couple is driving to their summer home in Alaska, Kasilof River Lodge, on the Kenai Peninsula near Homer. During the winter they live and work in Sebastopol! We talk to a young Israeli guy who is hitchhiking across Canada after spending six months in India. And another couple is from Maine; they just retired and are taking their first big trip in their RV together, driving across Canada starting in Montreal and ending up in Alaska (and after spending some time in Alaska, they’ll drive back to Maine across Canada via a different route). And we talk to a young man who is traveling to his job as a waiter at the Princess/Norwegian Cruises McKinley Lodge. 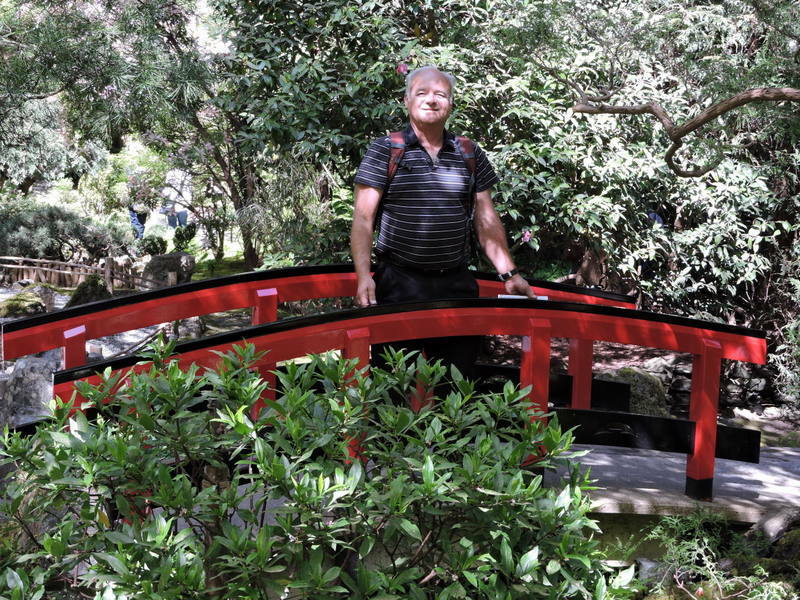 After our soak, we walk on the boardwalk and then stairs up to the Hanging Gardens, an area where lufa has built up from the warm water trickling through and lots of green plants are able to grow because of the heat. As evening falls, the view from the Hanging Gardens of the forest and surrounding mountains in the Provincial Park is magnificent. The moose is gone when we walk back to the RV after our soak but frogs are making a racket in the pond by the parking lot and we see more American Robins, Rusty Blackbirds, White-Browed Sparrows, and Canada Geese. We notice the car with Yukon plates that the man is driving from Cabo San Lucas; he’s towing one of those tiny teardrop trailers. The campground that was so full when we arrived is now practically deserted – just the way we like it! This entry was posted in Alaska Journey, Canada on October 27, 2016 by admin. Before we continue down the Alaska Highway, we fill up the RV with gas – the most expensive gas to date at CN$1.219/liter but it’s the cheapest available in Fort Nelson. Interestingly, the only choice is between Regular and Diesel. It seems counter-intuitive that gas is more expensive here in the heart of all these oil and gas exploration activities! Now we start driving due west on the Alaska Highway. The change in the weather has caused the birch trees that were bare yesterday to burst out their new spring leaves. The difference between yesterday and today in the appearance of the forest is truly astounding – and it’s much prettier today. The highway continually climbs after we leave Fort Nelson. Several times on our journey today we are forced to drive very slowly on a washboard gravel road through a long construction zone so as to not throw up any rocks. 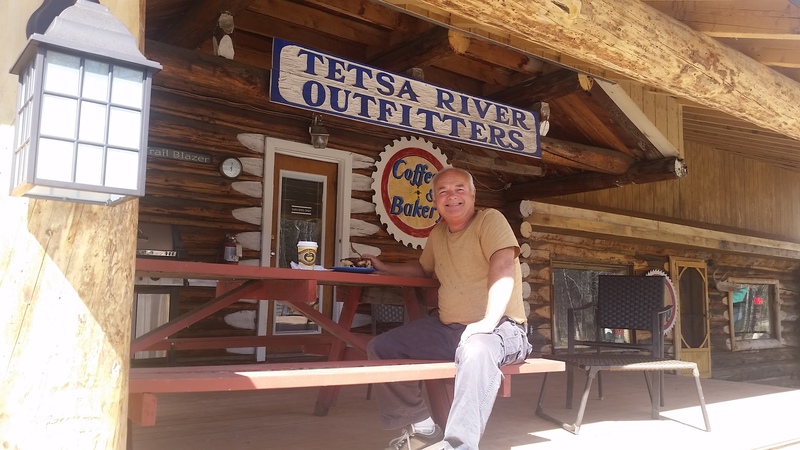 Mike had read in The Milepost that the bakery at Tetsa River Services (at Mile 357.5) serves not-to-be-missed cinnamon buns so we have to stop and try them. This place is so far off the grid that everything electric is run by a generator. 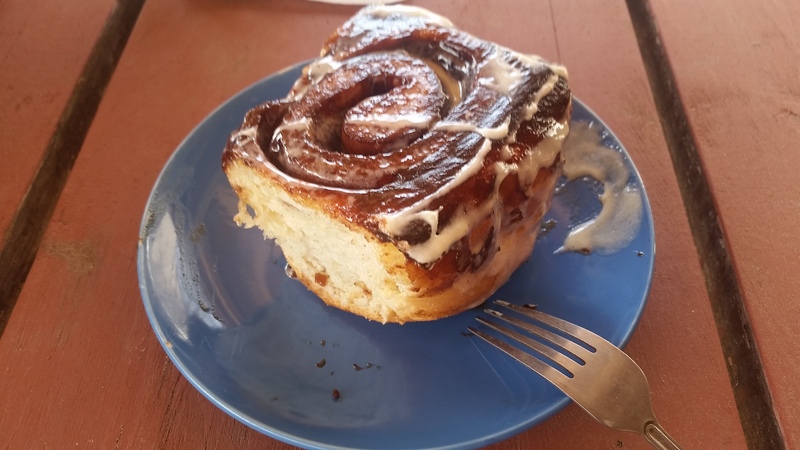 The proprietor heats up our cinnamon buns to go with our coffee and we eat them on the rustic porch. We pay him when he’s done broadcasting today’s weather on the radio. After our cinnamon bun stop, we continue traveling west on the Alaska Highway. The Tetsa River runs alongside the highway and there is patchy snow along the banks. The blue sky turns gray and a cold wind picks up. We cross the Tetsa River on a pretty bridge – spotting a beaver dam in the water – and enter Stone Mountain Provincial Park. As we drive, we enjoy magnificent vistas of high, dark, sharp-peaked mountains covered with snow. We stop at frozen but thawing Summit Lake and then enter Muncho Lake Provincial Park. Now fast flowing, blue-green Toad River runs along the highway for miles. 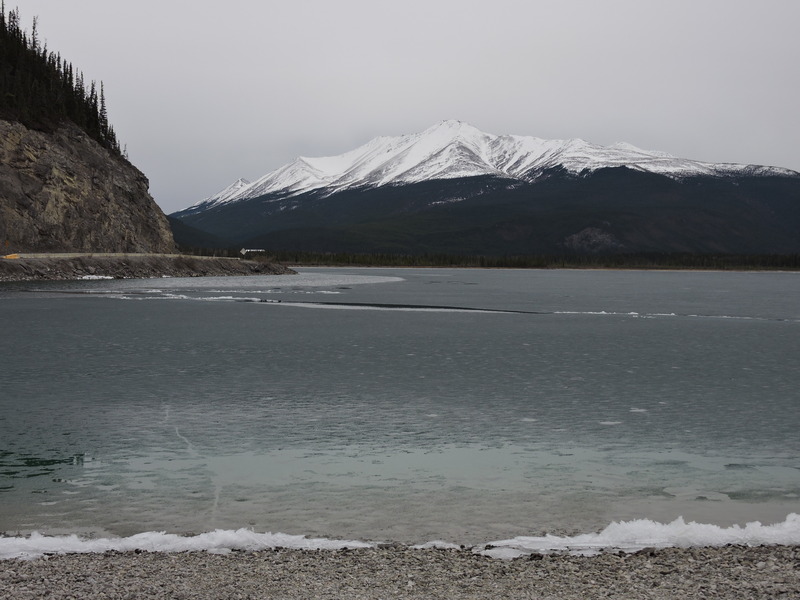 When we reach ice-covered Muncho Lake, we stop to walk down to the lake, even though it’s very cold with a brisk wind. The green water is crystal clear and we can hear the ice crack as we stand by the lake. 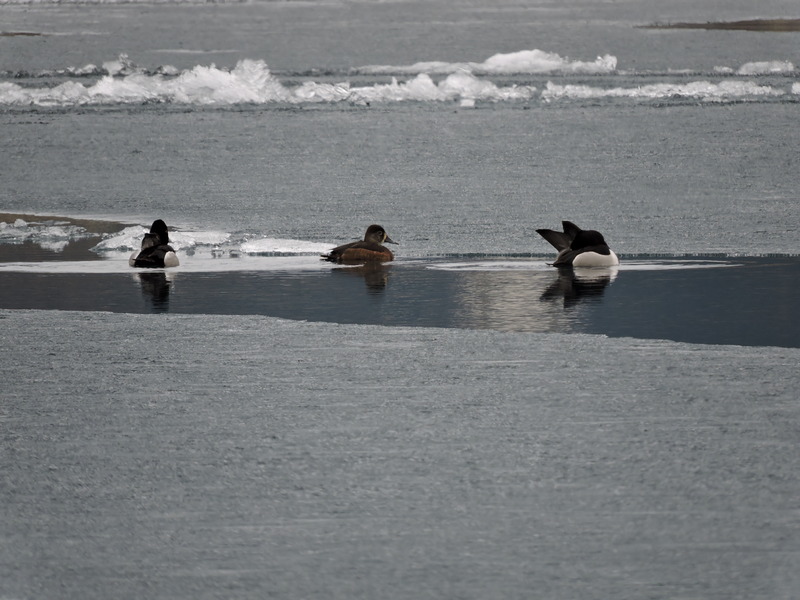 A few Ring-Necked Ducks swim around in an opening in the ice. Next, we cross the Trout River, and then the Prochniak River to leave Muncho Lake Provincial Park. It’s 6:00 pm when we see a car has gone off the road and is stuck in the soft dirt at the edge of the river. A group of First Nation young men is trying to pull the car up the embankment without much success. Of course, we stop to see if there is anything we can do to help. They ask if we have a rope. Do we have a rope? OF COURSE Mike has a rope! Mike ends up towing the car out using the RF, which I don’t think is a very good idea. But nothing bad happens and we’re able to pull the car out. Before we leave, the driver comes over to thank Mike, puts his arms around him, and says a prayer, which touches Mike deeply. It’s all over by 6:30 pm and we’re on our way again. 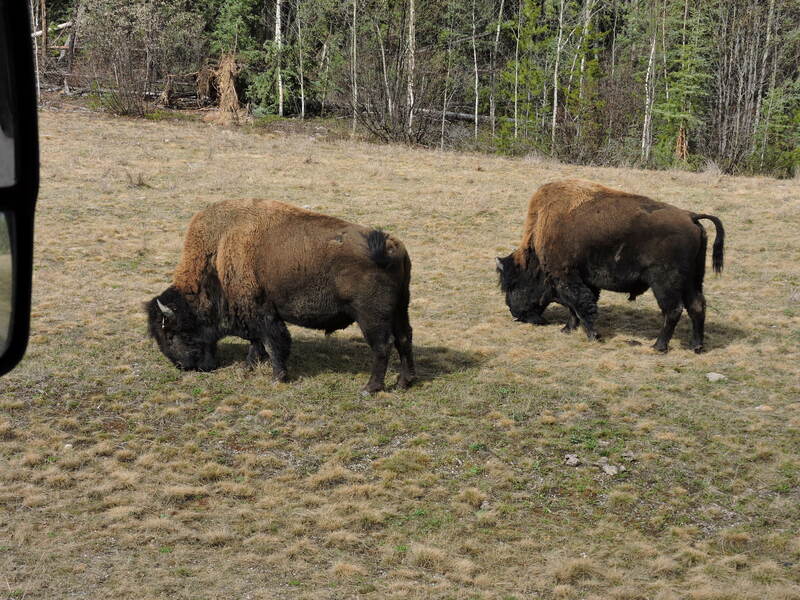 We soon see two female Wood Bison with two calves! We pull over to observe them and take photos. And then, a few minutes later, we stop again to watch another female Wood Bison and calf. The walk right past our RV, passing within a couple of yards of my open window. A little later, we see a big male Wood Bison munch on grass along the side of the highway. And then, a few minutes later, we stop again to watch another female Wood Bison and calf. The walk right past our RV, passing within a couple of yards of my open window. A little later, we see a big male Wood Bison munch on grass along the side of the highway. It’s almost 7:00 pm when we cross the Liard River bridge and see two more male Wood Bison (one on each side of the road) and another by the sign for Liard River Hot Springs Provincial Park, where we stop for the night. This entry was posted in Alaska Journey, Canada on October 26, 2016 by admin. We pull out of Pink Mountain Campsite & RV Park at about 10:30 am. For the first hour, the only “town” we pass through is Sasquatch Crossing. Spring hasn’t arrived yet to this more northern area; the spruce and birch trees are still bare. We climb and descend some grades, which let us look out over the unending forest that stretches to the Rocky Mountains in the distance. The other vehicles on the road are mostly oil & gas trucks that climb grades very slowly. Signs of civilization begin to appear as we near the town of Fort Nelson. We pass a huge building, the Spectra Energy Gas Processing Plant, and a gas pipeline that actually crosses the Alaska Highway. Muskwa Heights is an ugly unincorporated area with a rail yard, gas processing plant, fuel outlets, and the ubiquitous row after row of converted containers that serve as housing for the oil & gas exploration workers. Just outside of Muskwa Heights, we cross the wide Muskwa River. Midpoint of the bridge is the lowest elevation on the entire Alaska Highway at 1,000 feet exactly. We arrive at Fort Nelson at about 1:00 pm and although we’ve only been driving for 2-1/2 hours, we’re ready to stop for the day. 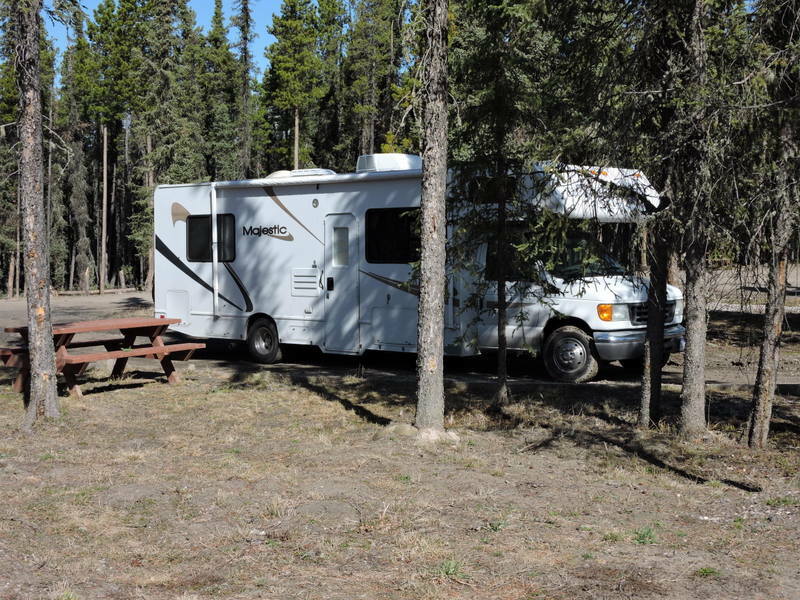 It takes just three minutes to drive through Fort Nelson and stop at the Triple “G” Hideaway campground at the northwest end of town. It’s the most expensive campground so far in Canada at CN$40.00 but has good Internet, laundry, and best of all, it’s located near the Northern Rockies Regional Recreation Center where there’s a 25-meter lap pool! Although the whole population of Fort Nelson is just 6,147 people, their recreation center is meant to serve the entire region. The whole facility is brand new. It houses (as one would expect) two ice arenas and a rink, racquetball and squash courts, a gym, climbing wall and Aquatic Centre. The 25-meter lap pool is amazing! No lanes are marked off; one just swims aligned with the lines on the bottom. Only two other swimmers besides Mike & me use the pool for the entire hour that we swim. And after our swim, Mike & I soak for ten minutes in the huge hot tub – heaven! This entry was posted in Alaska Journey, Canada on October 25, 2016 by admin. To get to Anchorage, Alaska, from the U.S., many travelers drive the Alaska Highway (sometimes called the ALCAN). The Alaska Highway starts in Dawson Creek, British Columbia. It then travels 1,387 miles through B.C. and Yukon Territory to its official endpoint in Delta Junction, AK. 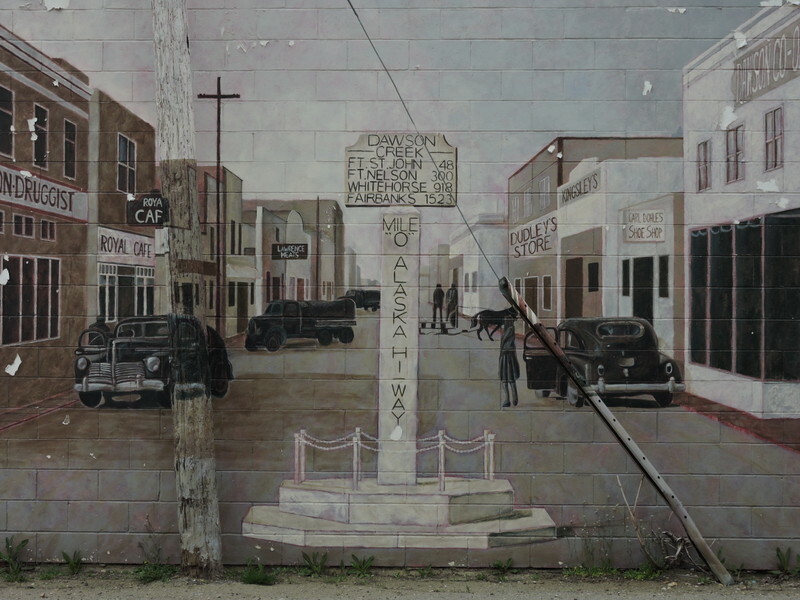 After leaving Vancouver, it takes us three and a half days of driving through British Columbia just to get to the town of Dawson Creek where the Alaska Highway begins. We find the “Mile 0” marker for the beginning of the Alaska Highway, park the RV in a vacant lot, and walk over to take a photo to commemorate this historic occasion. The marker is in the center of a busy intersection so we have to dodge traffic to run out to it. It seems like the drivers are used to tourists doing this! Interestingly, the milepost shows 1,398 miles to its official endpoint at Delta Junction but due to some improvements to the highway a few years ago that straightened it out, the actual mileage is now “just” 1,387 miles. The nice woman who took the photo runs a small but extremely interesting museum called The Alaska Highway House. We take some time to tour the (free) museum. 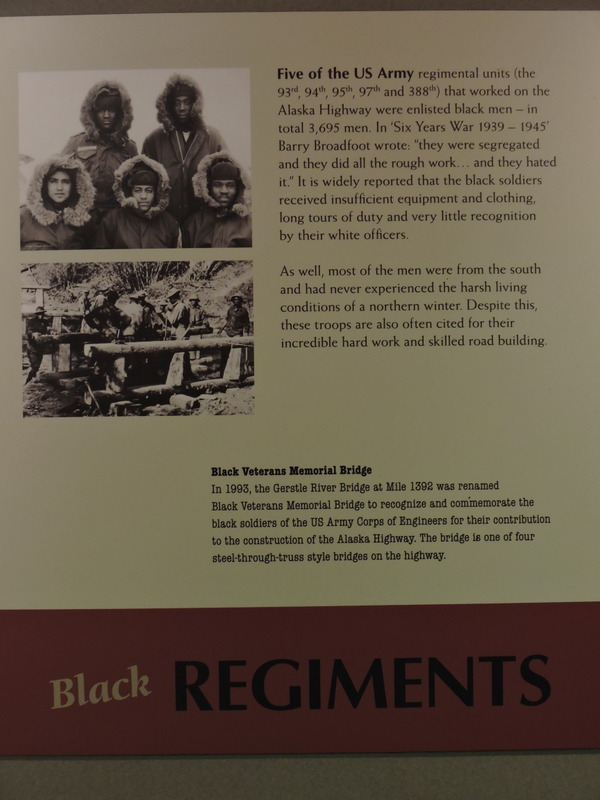 We learn that the Alaska Highway was constructed by the U.S. Army in just nine months after the bombing of Pearl Harbor in 1942. Since Canada took over responsibility for the Alaska Highway in 1946. It’s been improved over the years – it’s actually several miles shorter now than it was in the past because it has been rerouted and some of its curves straightened out – but it has only been fully paved since the 1980s. It’s 3:30 pm by the time we start our journey on the Alaska Highway (aka BC-97 north). And then we only drive 17 miles before we take our first detour to see a section of the old Alaska Highway and the only original timber bridge still in use. We drive across the curved Kiskatinaw River Bridge and then park so we can walk back across it in order to take in the view of the river far below. The side road that takes us over the bridge is a short loop and we re-enter the Alaska Highway at Mile 22.5. 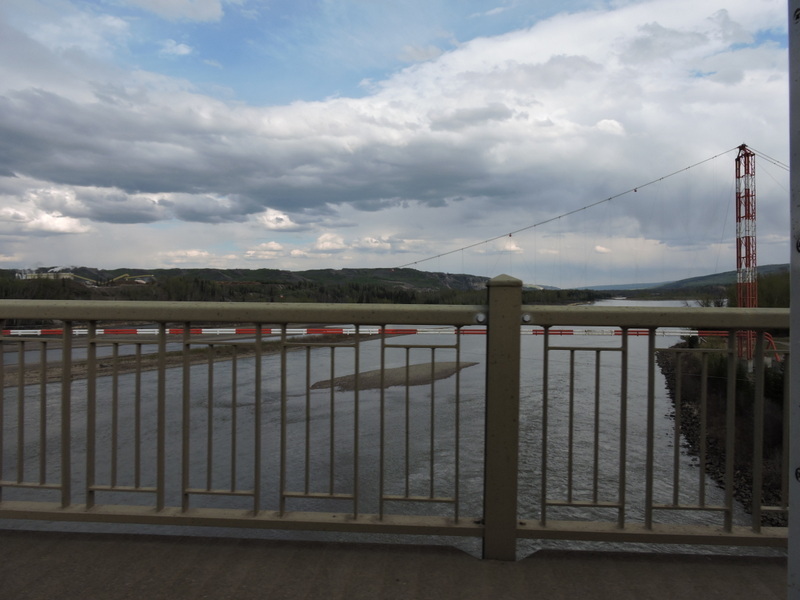 A few minutes later it starts to rain as we cross the Peace River Bridge and pass through the town of Taylor. We take a break about 4:45 pm when we reach Fort St. John, which is definitely the biggest town we’ve been today (population 18,000) with several malls, a movie theater, hospital, airport, etc. We stop for coffee and a donut at Tim Horton’s, where we discuss whether or not to stay in Fort St. John tonight or keep on driving. It’s stopped raining, we’re not tired of driving yet, and Fort St. John seems like an ordinary city without much interest, so we decide to keep driving for another hour or so. 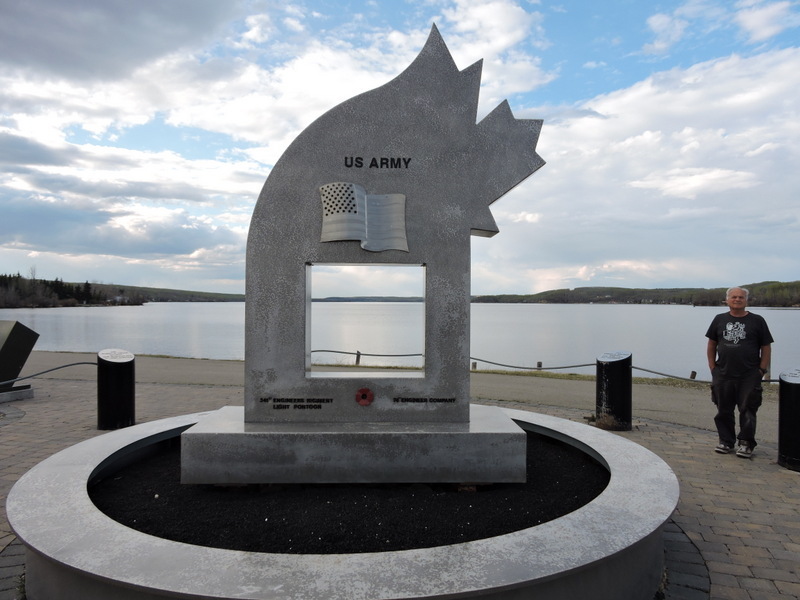 We stop at Charlie Lake to see the memorial to twelve U.S. Army soldiers who died in 1942 when their pontoon boat capsized and they drowned. It doesn’t seem like that large of a lake for such a disaster but the interpretive sign explains that most of the soldiers couldn’t swim, the water was icy cold, and they were wearing heavy winter clothing and boots. Five soldiers were rescued by a local fur trapper in his rowboat. There’s a wetland area under restoration at Charlie Lake – I can hear the distinctive trill of a Red-winged Blackbird and finally see one perched atop a cattail as they typically do. 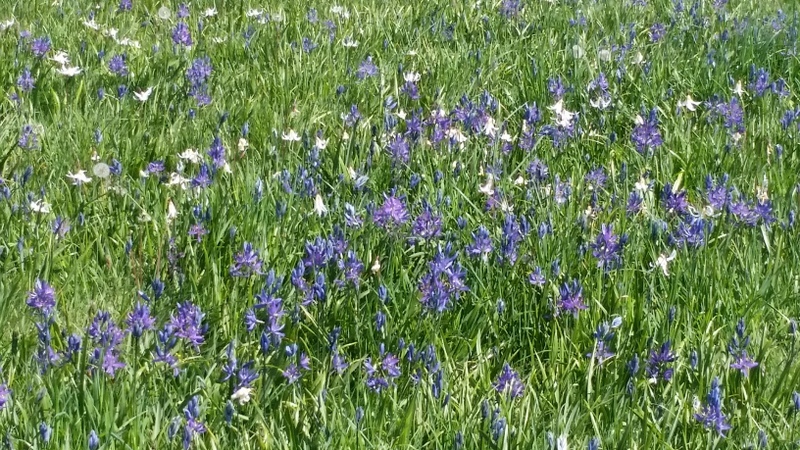 As we continue driving through gently rolling countryside broken only occasionally by a small farm or ranch. There are acres and acres of trees, mostly spruce and birch. We pass through the amusingly-named town of Wonowon at Mile 101. We occasionally pass “camps” consisting of row after row of modular housing where the oil and gas exploration workers live. We stop for the night at about 7:45 pm at Pink Mountain Campsite & RV Park at Mile 143. We get a nice pull-thru site for the discounted price of CN$30.00 because as the woman in the office explains it, “There’s no sewer because the septic hasn’t thawed out yet.” We’re the only ones staying there tonight. This entry was posted in Alaska Journey, Canada on October 24, 2016 by admin. To drive to Alaska from the U.S., most travelers take the Alaska Highway, which extends 1,387 miles from Dawson Creek, British Columbia to Delta Junction, Alaska. 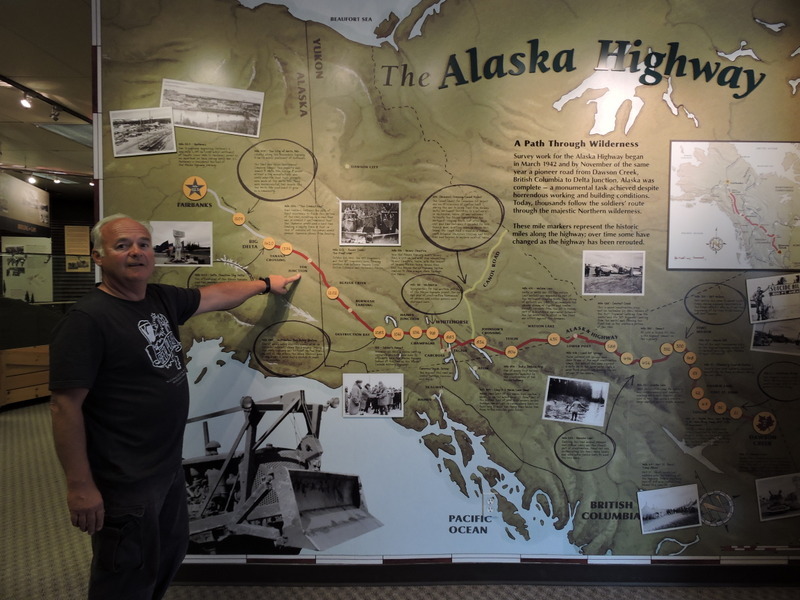 But before we can do that, it’s a three and a half day drive from Vancouver through British Columbia just to get to the beginning of the Alaska Highway in Dawson Creek. 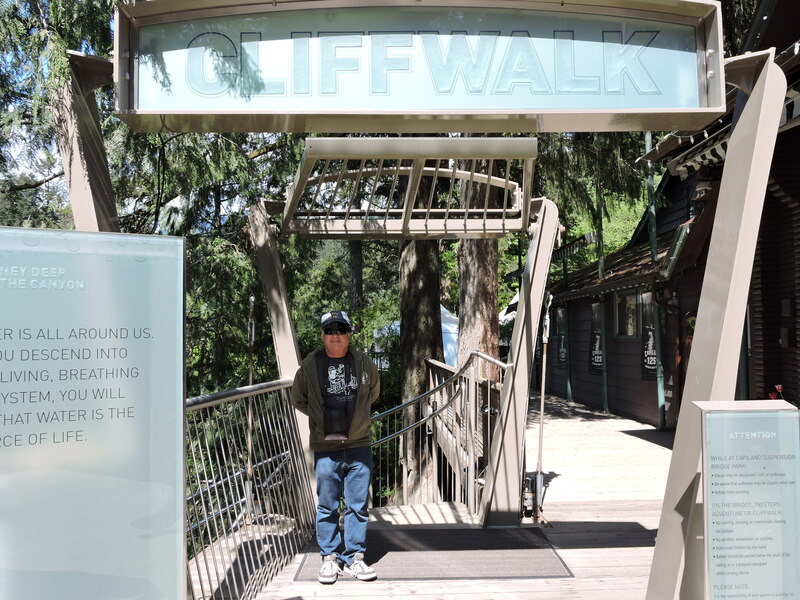 Before we leave Vancouver, we spend a few hours at Capilano Suspension Bridge Park. I’m a little nervous at first but both Mike & I thoroughly enjoy the view as we walk across the 45 feet long, 230 feet high Suspension Bridge. Far below, the Capilano River rushes through the canyon. The bridge sways quite a bit as people walk across it but I remind myself that there’s been a bridge here since 1889 and there have been no accidents. Once we’re on the other side of the canyon, we explore Treetops Adventure. 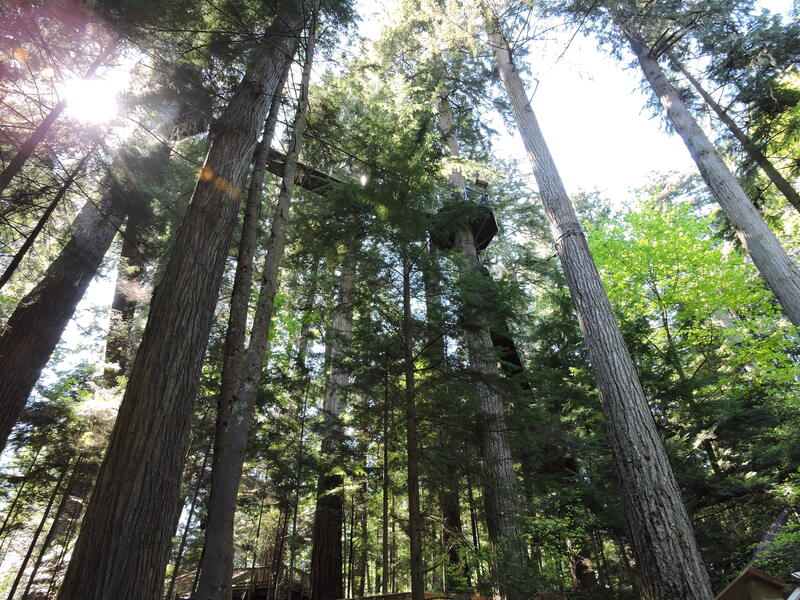 It starts in a treehouse and continues on seven suspension bridges through magnificent old growth Douglas firs. These shorter suspension bridges don’t sway as much as they connect platforms high in the canopy. We enjoy Treetops Adventure so much that we walk around and do it again! The Cliff Walk is our last activity. It’s a narrow wooden suspending walkway winding its way down the cliff face with spectacular views of the canyon and the river below. I like it because it doesn’t sway like the Suspension Bridge. At one point there’s a glass panel to stand on over the abyss and at another point there’s a grate that juts out over the canyon, which is actually more unsettling to stand on than the glass. We could spend all day at Capilano Suspension Bridge Park but we want to make some progress today so we start driving at 3:00 pm. BC-99 is known here as the “Sea to Sky Highway”. 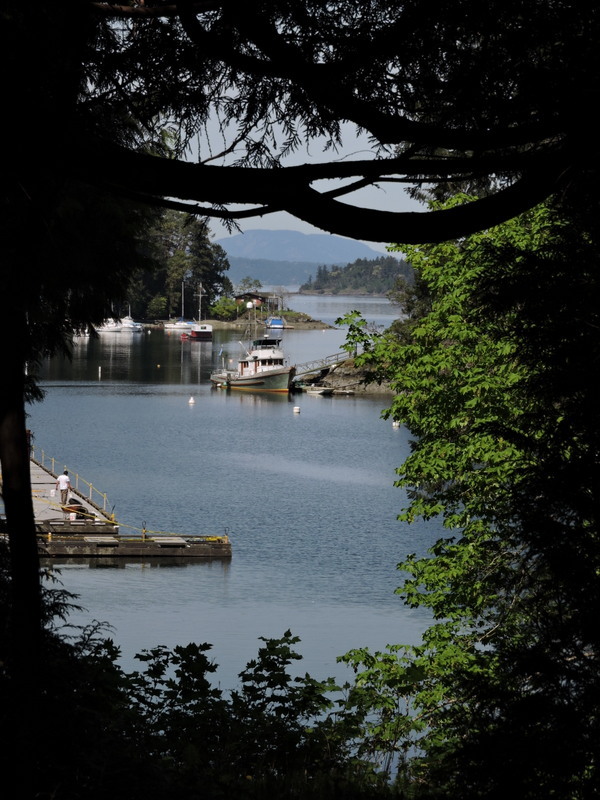 It runs along Howe Sound past Horseshoe Bay, Lions Bay, and Furry Cove. It looks like a fjord with the heavily forested mountains (topped with patches of snow and wreathed in clouds) sloping steeply down to the bright blue water. 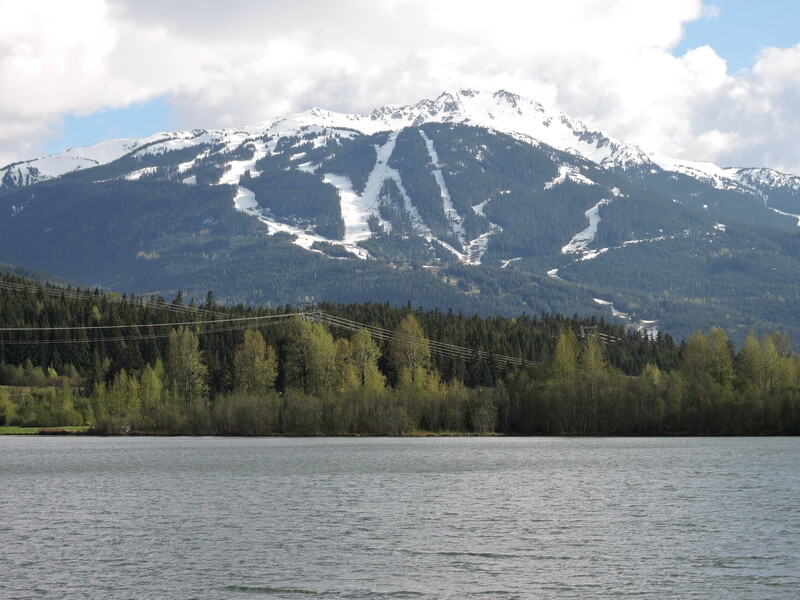 It takes about two hours to reach Whistler, where we take a drive through Whistler Village. It reminds me a lot of Breckenridge with its condos, hotels, and restaurants. Although it’s almost the end of April, the gondola is still running, the parking lot at the ski area is full, and there are lots of skiers and snowboarders walking back after a day on the slopes. The drive after Whistler is one of the prettiest we’ve ever been on. 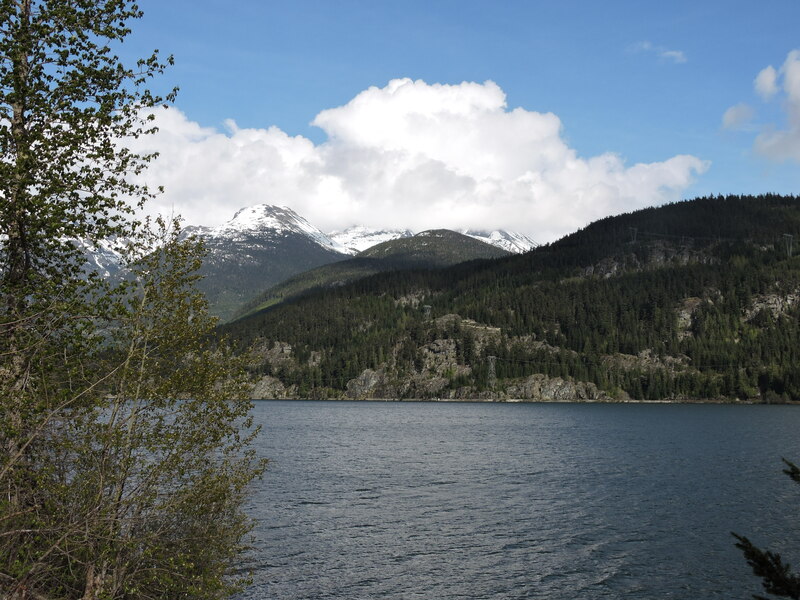 The mountains with their snowy peaks and glaciers surround us while we drive through healthy green conifer forests, along rushing rivers and creeks, past too many waterfalls to count, and along scenic lakes. We drive for at least 100 kilometers without any sign of human habitation and only a few cars pass us. As it starts to get dark, we see numerous deer munching on the foliage along the side of the road so Mike has to drive the RV extra carefully. It’s 8:00 pm by the time we pull into the First Nation town of Lillooet. We’re a little worried because we haven’t seen an open campground since we left Vancouver – they’re all “Closed for the Season”. 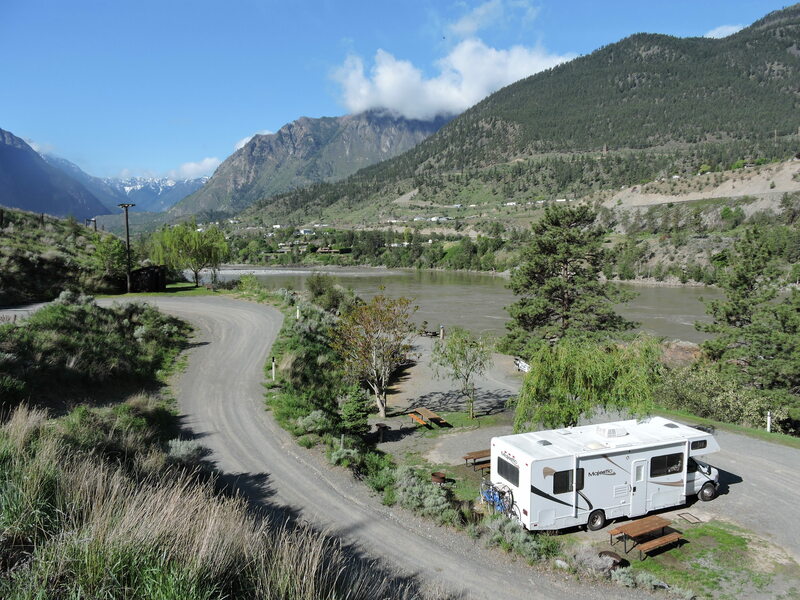 But a few more kilometers down the road, we find the lovely, OPEN Fraser Cove Campground on the banks for the mighty Fraser River and stop for the night. The next morning we take a walk around the campground and along the Fraser River before we continue driving on BC-99. We get only a few kilometers down the road when we see such an impressive waterfall bursting out of the cliff across the river that we have to stop to appreciate it (and take some photos). The landscape changes, becoming drier with less trees. There are some widely spaced pines but mostly the vegetation is characteristic of high desert. The winding road follows a deep canyon through which the Fraser River flows. We take a little detour to the town of Cache Creek for lunch and have some absolutely terrible Chinese food for lunch; although they call it Chicken Chow Mein, it’s basically Top Ramen with no vegetables or sauce, topped with a couple of microwaved chicken pieces. I don’t know how the waitress is able to serve it with a straight face. 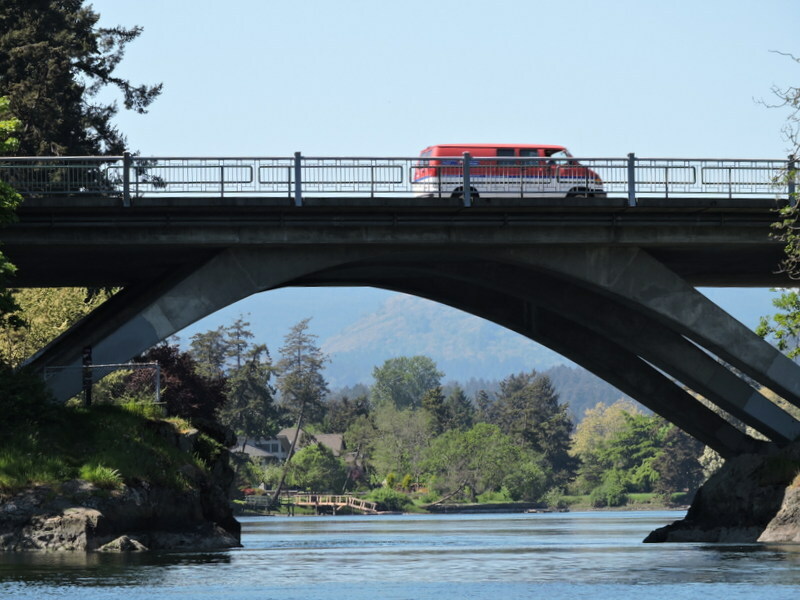 We get on the road again but now we’re driving on BC-97, known as the “Cariboo Connector – Gateway to the North”. Our next stop is the town of 100 Mile House. 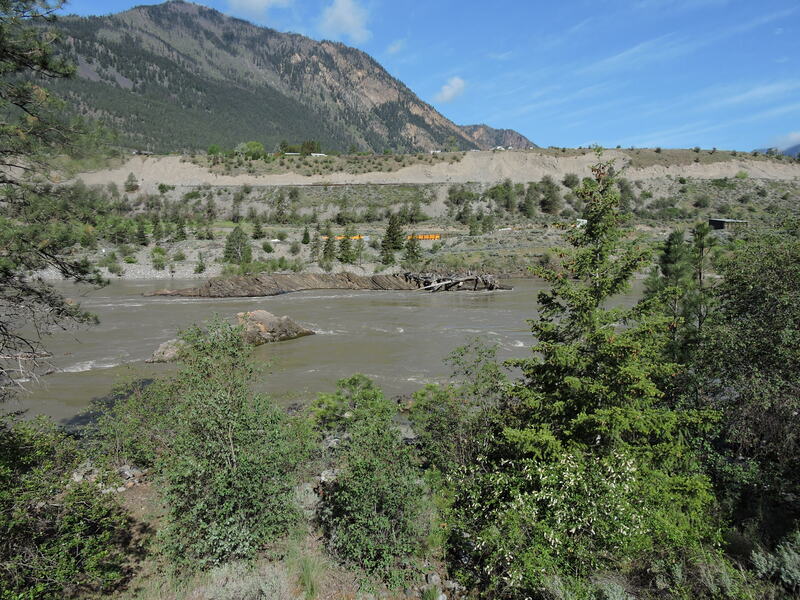 Originally a stage stop, it was named for its distance from Lillooet. It’s a big town with a car dealership, airport, banks, and the Caribou Mall. There’s even a Safeway where we stop to do a little grocery shopping before continuing our drive north. Our afternoon drive takes us past several beautiful lakes full of waterfowl – Lac la Hache, 130 Mile Wetlands, Williams Lake, and McLeese Lake. We stop at a small no-name lake where we walk down to the public floating fishing dock. I see several Lesser scaup swimming and hear, but can’t see, Red-winged blackbirds in the cattails. After driving almost 300 miles today, we stop for the night a little earlier at 6:30 pm in the tiny town of Hixon at the Canyon Creek Campground & RV Park. Very few campers at this time of the year but at least it’s open! The next morning, thanks to a suggestion from our campground hosts, we backtrack south on BC-97 for a few minutes, and then turn onto a dirt road. 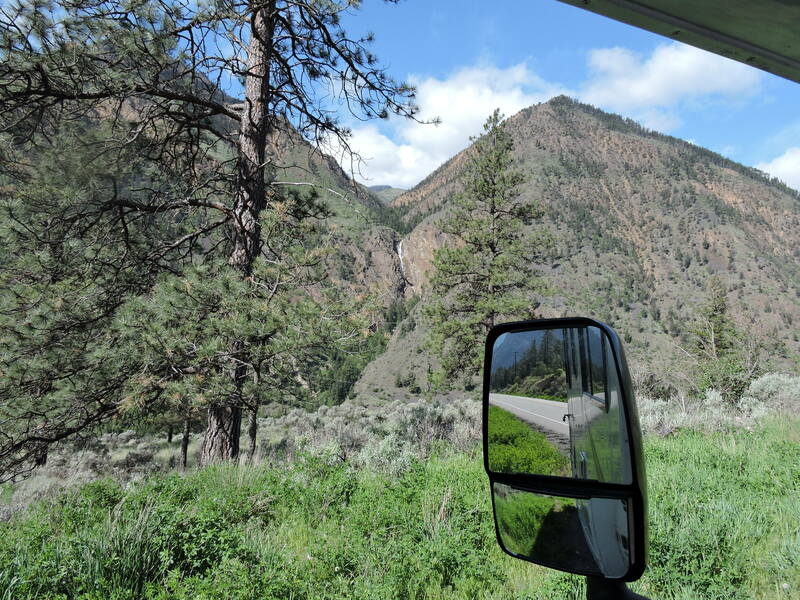 We drive for a couple of kilometers until it looks too steep and narrow for our RV. So we park, continue down the dirt road on foot, and then hike on a path across two foot bridges. We hear Hixon Falls before we see it. Because it’s spring, the water is literally exploding over the falls and then tumbling down Hixon Creek in a torrent. 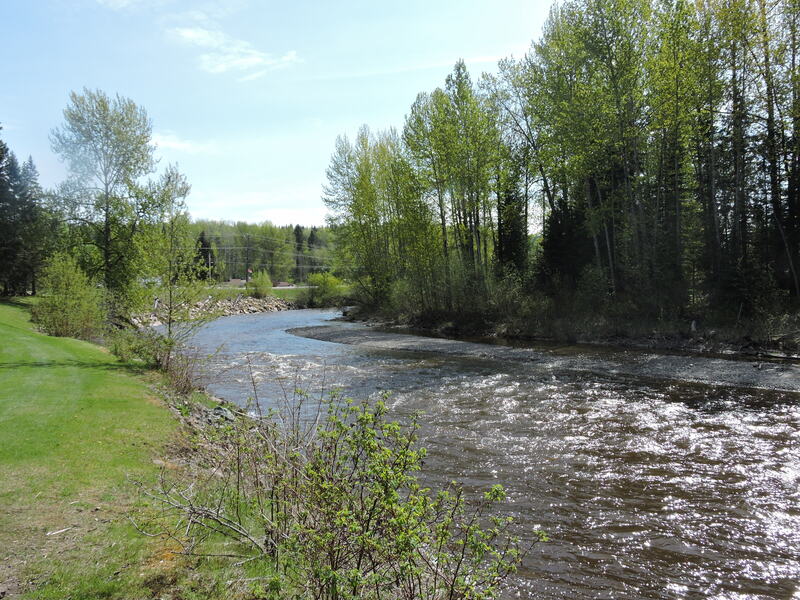 After enjoying the beauty of Hixon Falls and Chute, we get back on BC-97 and resume our journey north to the fairly large city of Prince George. After Starbucks, lunch, and a trip to the post office, we continue driving north. The scenery is pretty monotonous with trees, lakes, trees, rivers, trees, lakes…and then at about 5:30 pm we see our first black bear foraging in the foliage at the side of the highway! Ahead of us we see a mountain range with snow-covered peaks. This is the Rocky Mountain Trench, marking the western boundary of the Rocky Mountains. We’re steadily climbing through the Misinchjnka range of the Rockies when we see a sign for Bijou Falls Provincial Park and decide to stop. Another amazing waterfall gushing down the mountain, full of spring run-off – really spectacular! We continue to climb until we crest Pine Pass, elevation 3,061, the high point on this highway, even though it’s not really not all that high. We pass frozen Azouzetta Lake (although I wouldn’t walk out on it). Snow is everywhere along the highway until we descend to a lower elevation. Dusk is a great time to see animals but we have to be very alert to avoid animals on the highway. A second black bear ambles through a grassy meadow by Pine River. A few minutes later, two white-tailed deer run across the highway right in front of the RV but Mike avoids hitting them. Then we see a herd of about six elk in a meadow. At 7:50 pm we see a sign for the Peace Foothills and we’re treated to a view across a wide verdant valley with a river snaking its way down the middle. We stop for the night at the first open campground, Caron Creek RV Park. 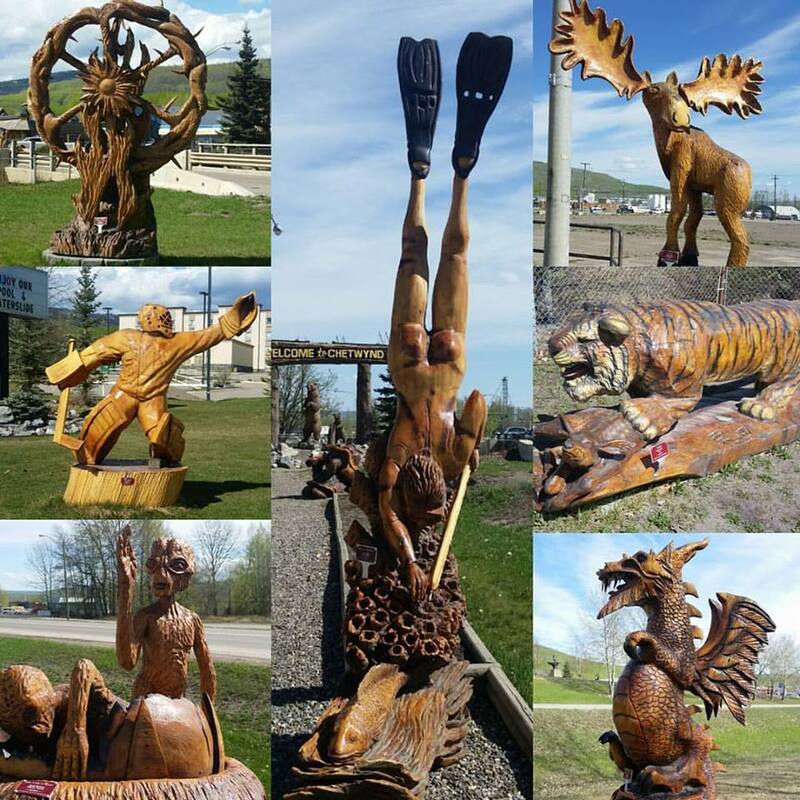 The next morning, it’s just a 10 kilometer drive to Chetwynd, a town renowned for its chainsaw carving and the “Home to the International Chainsaw Carving Championships”. We spend the next hour walking around the town to see as many of the chainsaw carvings as we can. They’re everywhere: along the main street, in vacant lots and shopping centers, and in front of businesses. Apparently, the carvings are all finalists in the chainsaw carving championships of years past. Subjects include mystical creatures (especially dragons), animals from moose to tigers, First Nation warriors, cowboys, hockey players, and even little green men in a flying saucer. Next stop is the town of Dawson Creek and the start of the Alaska Highway! This entry was posted in Alaska Journey, Canada on October 15, 2016 by admin. Today we want to take a bike ride so at about 10:00 we check out of our hotel and walk past the Parliament up to Douglas St, where we’ve been told there’s a place to rent bicycles. It’s already very warm & sunny. 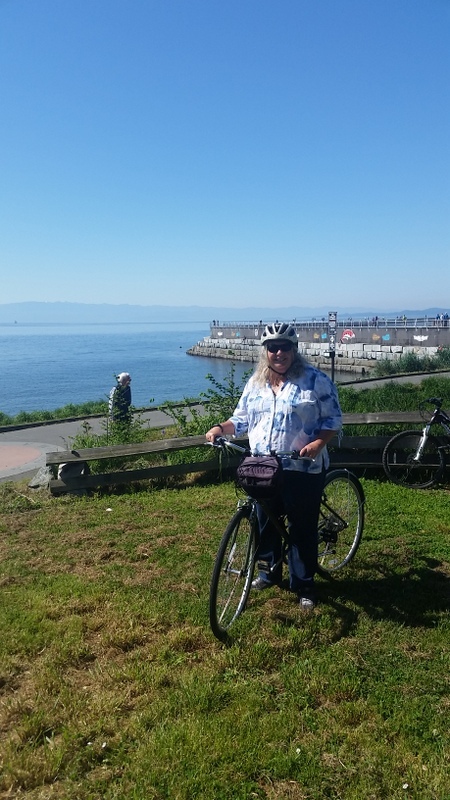 We find the bike rental shop, rent our bicycles, and before we know it, we’re riding along the shore of James Bay. Beach on St James Bay near the Coast Guard base – driftwood in all sizes from giant logs to tiny splinters! We return our bikes after a two hour ride and then we walk down to the waterfront. We’re hot & tired from our bike ride (it was fun though) so now we want to do something cool & restful. 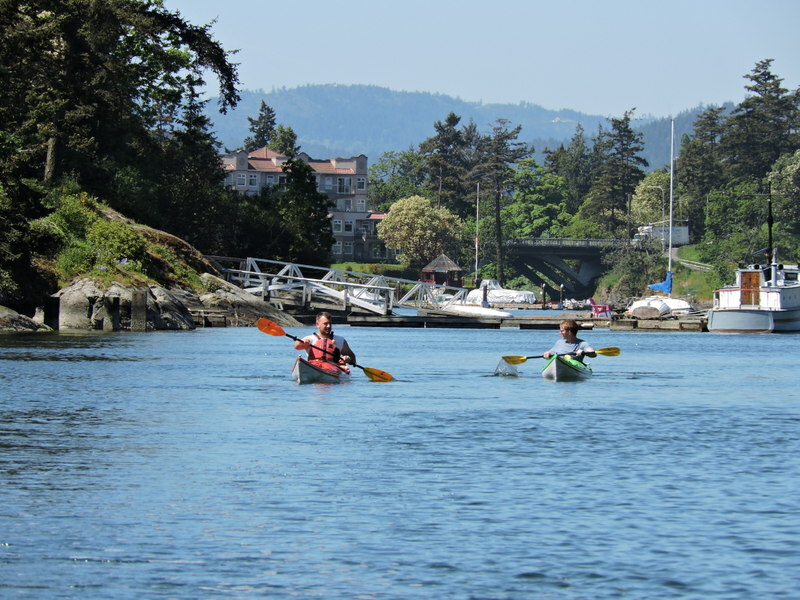 A 60-minute boat tour of Victoria Harbour is the perfect activity! We decide on The Gorge tour with Victoria Harbor Ferry Co, the same company that runs the water taxis, on an electric boat. We start the tour at the Causeway part of the Inner Harbor in front of the Grand Empress Hotel. We motor past the Harbour Air Terminal, pass under the “Blue Bridge”, and go by the Port Hope Shipyard, the only shipyard left in the Victoria area. Beautiful homes line the the waterway as we near Burnside Gorge. 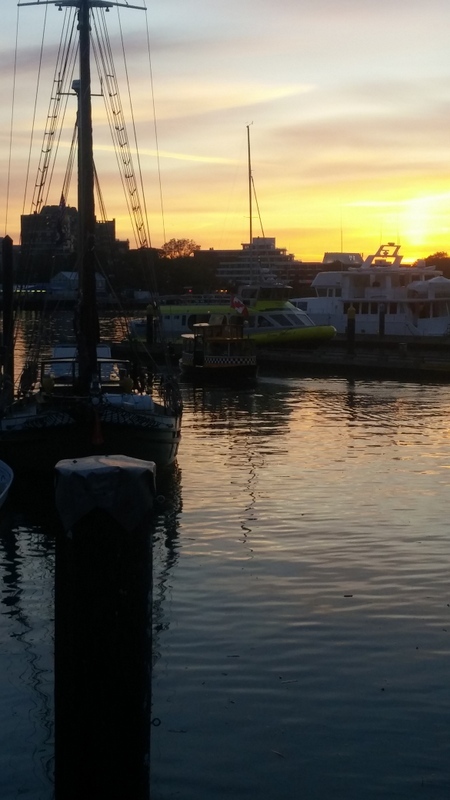 Numerous boats are anchored in the middle of the waterway here. The captain explains that people live on some of them and others have just been abandoned because they’re so old they’re no longer worth anything, which is a big problem for Victoria. We get as far as Tillicum Bridge, and then we have to around because of the shallow water & turning tide. On the boat ride back to Victoria Harbour, we’re lucky enough to see the Blue Bridge open to let a larger ship through. The tour ends by taking us by Fisherman’s Wharf and the Floating Home Village. 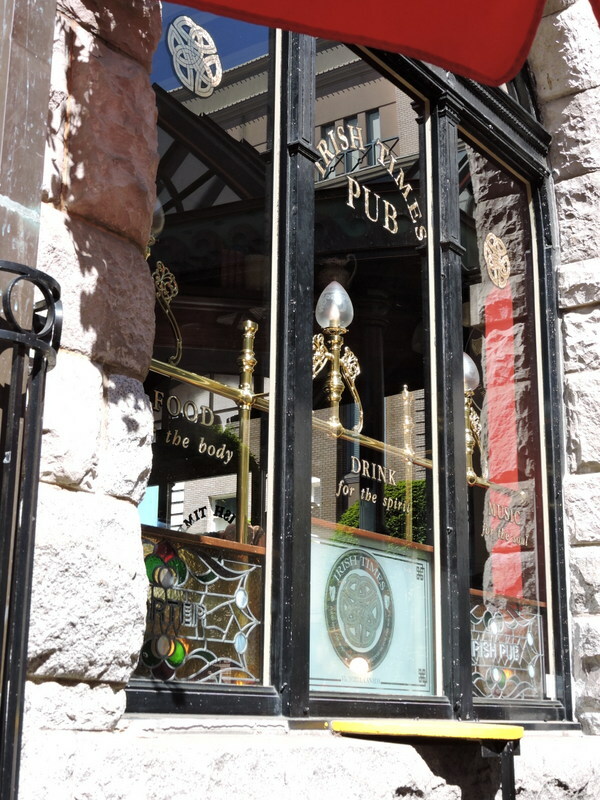 After our boat tour, we walk up Government street to have lunch at Irish Times Pub. We sit outside by the sidewalk in prime people-watching territory but (thankfully) mostly in the shade. We order a Strongbow hard cider and share a Forest Mushroom white pizza (made with Brie). I’m not sure what’s Irish about it but it’s delicious. After lunch we stroll back down to the waterfront and walk back to our hotel. We retrieve our luggage and relax in the lobby with the Internet for about half an hour. 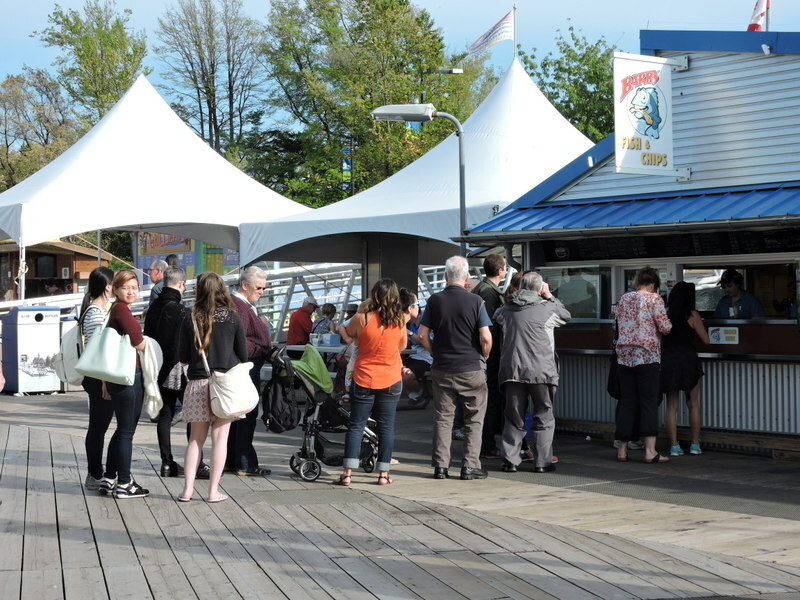 Then at 4:30 we walk the short distance to the Victoria Clipper ferry terminal. We go through U.S. Customs & Immigration right there in the terminal. The ferry crossing is very comfortable and we enjoy watching the beautiful scenery go by. Although it’s very windy outside, Mike & I make it a point to go out on the back deck to watch the spectacular sunset. 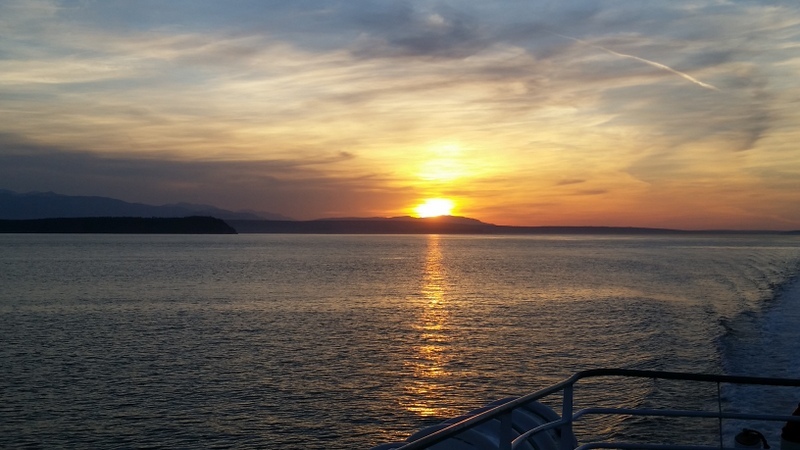 Gary & Rita are there at 8:45 to pick us up – we see them waving as we disembark. It takes a few minutes to go through U.S. Customs & Immigration (what was the point of doing it in Victoria?) and then it’s a short drive back to Gary & Rita’s RV Park. We walk over to our RV in guest parking and sneak in to spend another free night. This entry was posted in Alaska Journey, Canada on June 6, 2016 by admin. 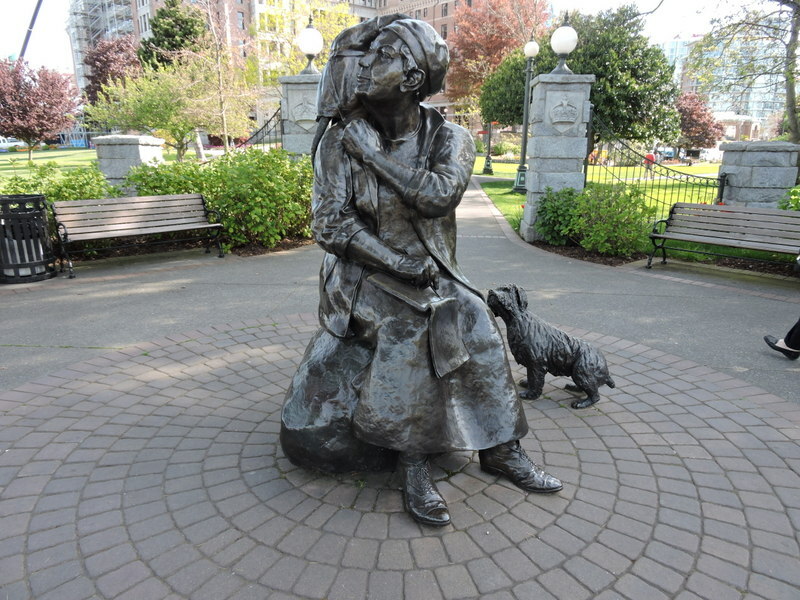 This morning we walk several blocks from our hotel through the grounds of the British Columbia Parliament to a park with a bronze statue of author & artist Emily Carr (with her dog ‘Billie’ & her Javanese monkey ‘Woo’). I have no problem walking this morning – I wore my comfortable sneakers! 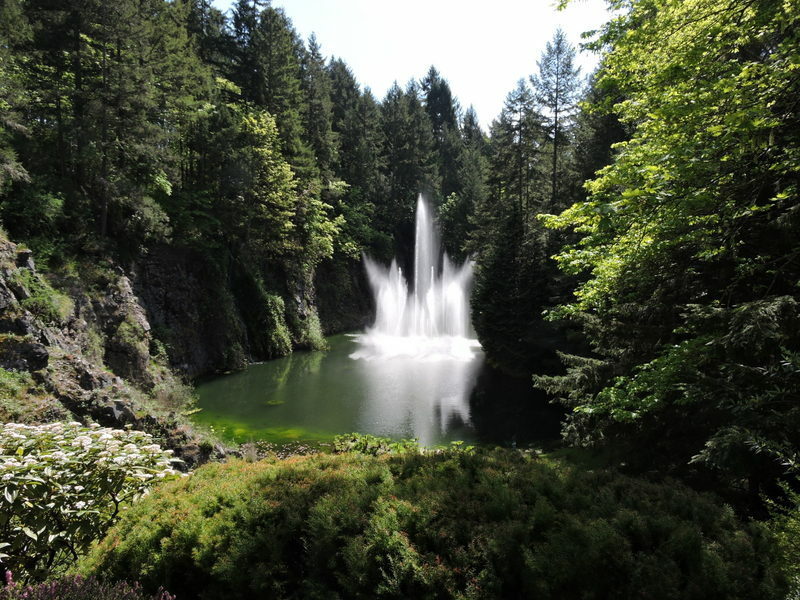 We catch a bus to The Butchart Gardens, one of Victoria’s most iconic sights. Mike & I enjoy taking public transportation so we can see more of Victoria, including the “non-touristy” areas where people actually live. 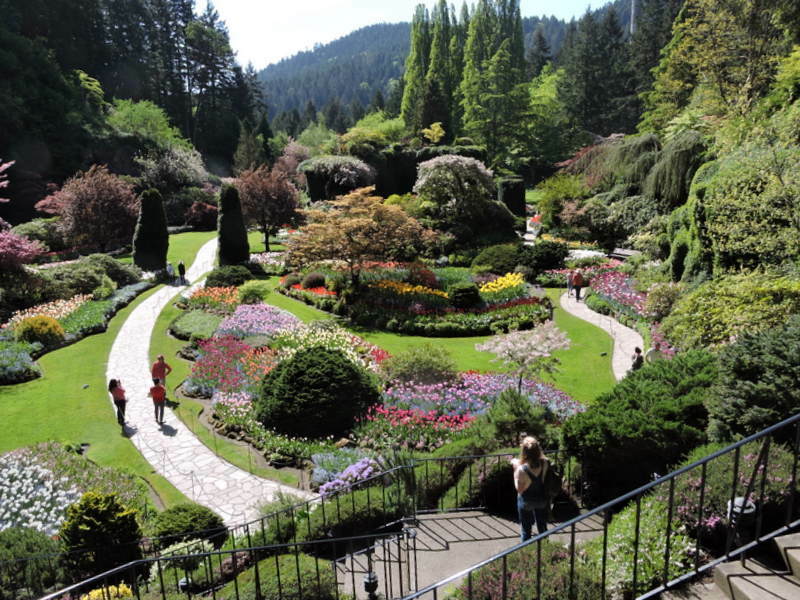 We arrive at The Butchart Gardens at about 11:30 and spend three hours wandering around, drinking in the beauty. These 55 acres of gardens were created in the early 1900s by Jennie Butchard to beautify the worked-out limestone quarry on their property. 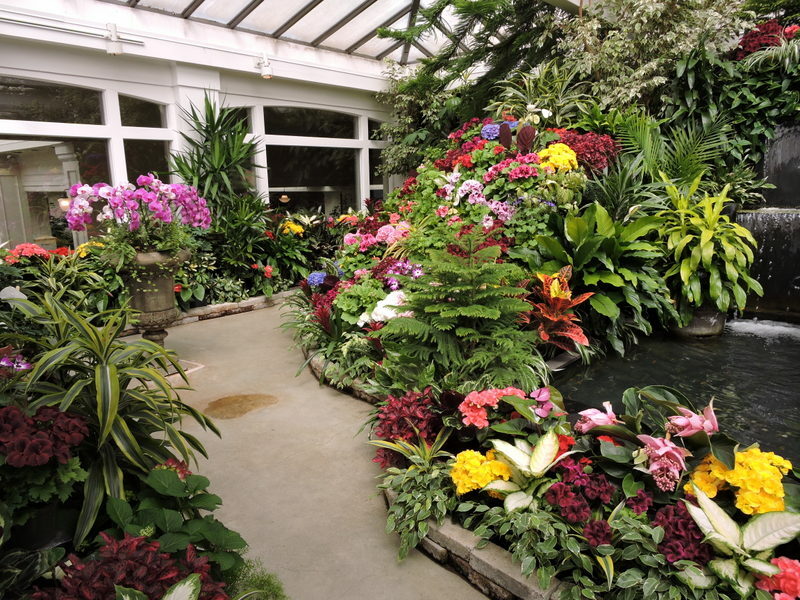 Today the gardens are still owned by the Butchart family and receive about a million visitors annually! 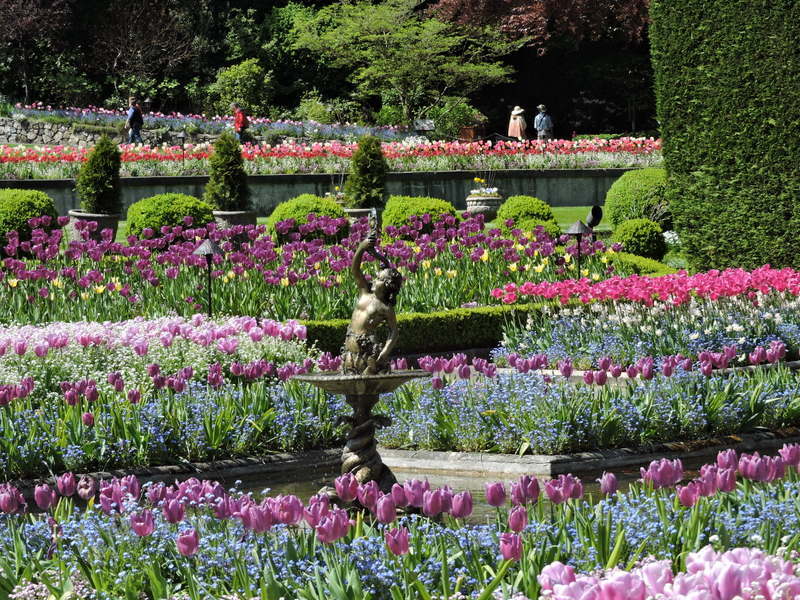 My favorite garden is the Sunken Garden, an old quarry transformed with a riot of colorful tulips, daffodils, and other spring flowers. At the end of the Sunken Garden, there’s Ross Fountain that rhythmically shoots the water in different designs, like the Bellagio fountains in Las Vegas but without the music. 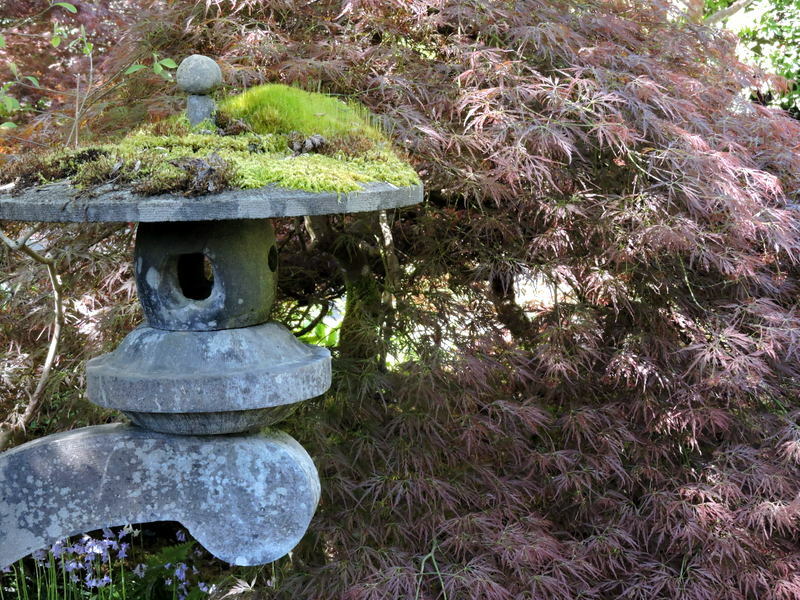 We also enjoy the Japanese Garden and the Italian Garden (it’s a bit too early in the season for the Rose Garden). After all that walking, we relax in the shade at Butchart Cove Lookout and just gaze at the water. 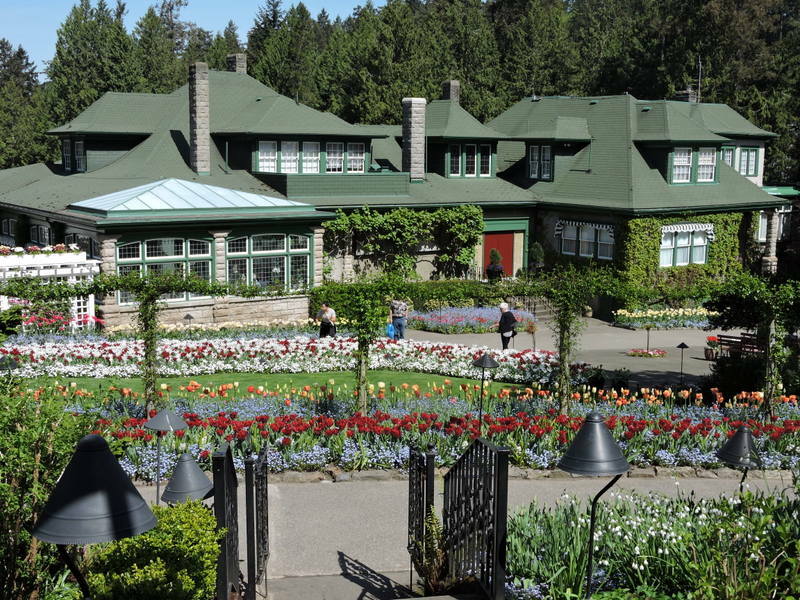 At the greenhouse, we take a moment to ask the question we’ve been wondering about: “How many gardeners are needed to keep Butchart Gardens so beautiful?” The answer is anywhere from 50 (in the off-season) to 70 gardeners! We’re also shocked to find out that when all these beautiful flowers are done blooming, they’re simply pulled up & turned into mulch. We take the bus back to downtown Victoria and then walk the rest of the way back to our hotel. We take just a minute to freshen up before heading out again, this time walking west (the opposite direction than we usually walk to the Inner Harbour). We walk along the waterfront trail and see a community of charming houseboats. 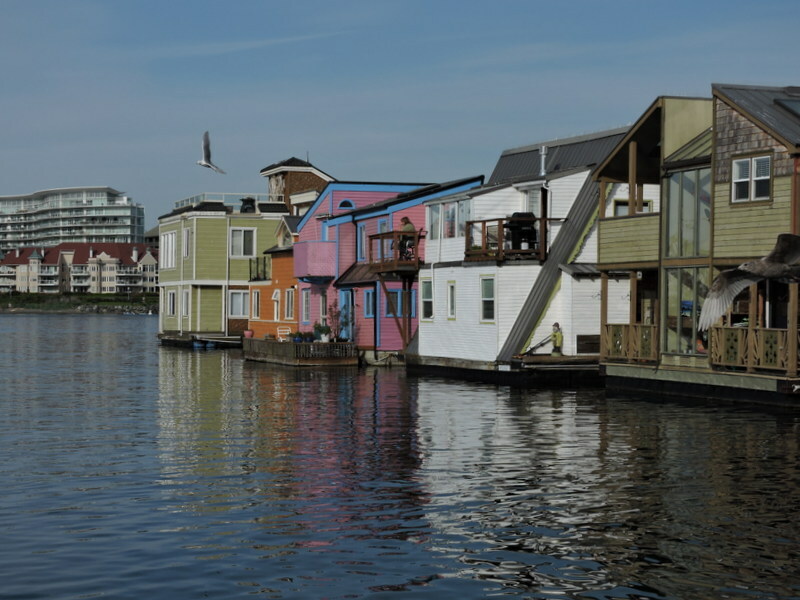 The houseboats turn out to be a in Floating Home Village that also includes shops, restaurants, & fishing boats in an area known as Fisherman’s Wharf. We get a dozen oysters at The Fish Store (another “Buck a Shuck” special) and eat them at one of the picnic tables by the marina. 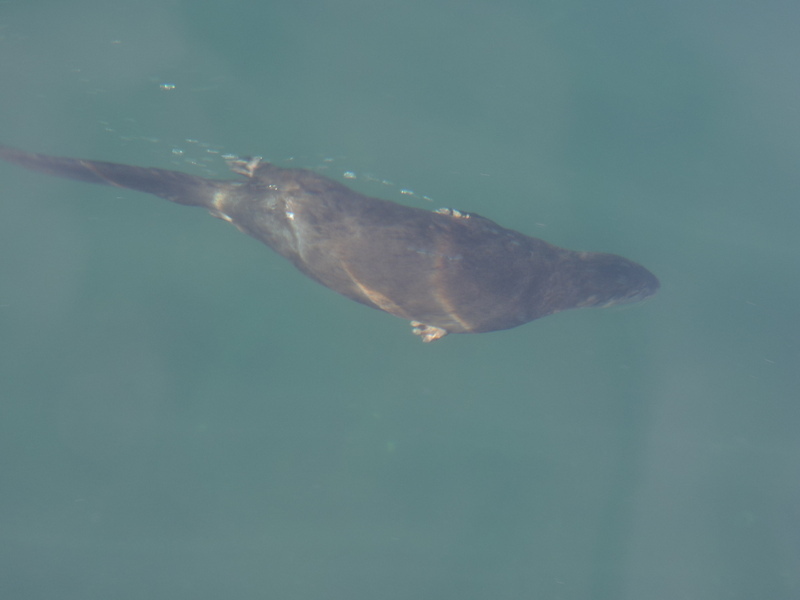 RIVER OTTER at Fisherman’s Wharf! Five harbor seals are gathered there, begging for fish. 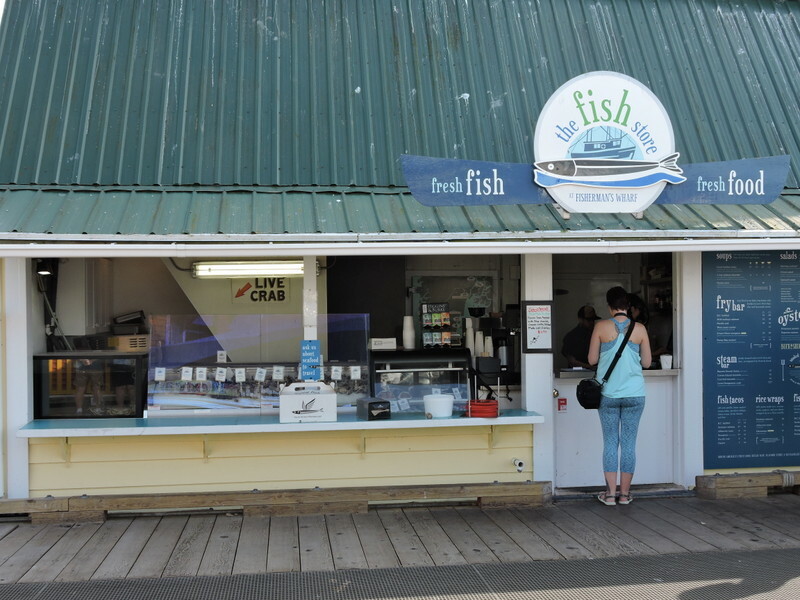 The Fish Store sells cut up pieces of fish for the tourists to feed the seals! There are also river otters but there are also warnings not to feed them (Mike is told “They’re vicious creatures – they’ll bite your finger right off.”). We don’t buy any fish because we can watch everybody else feeding them. 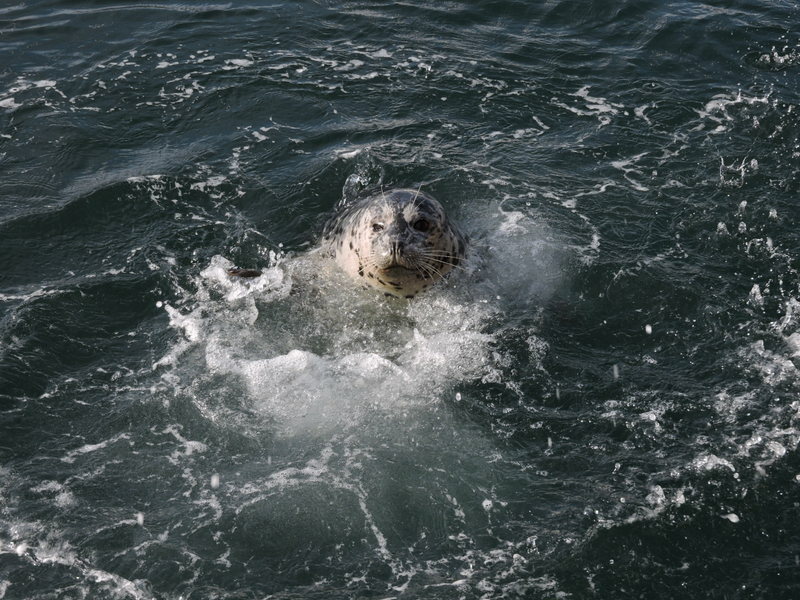 The seals get impatient if they have to go a while without being fed and splash the people. Barb’s Fish & Chips where we bought our fish & chips – note the huge line! 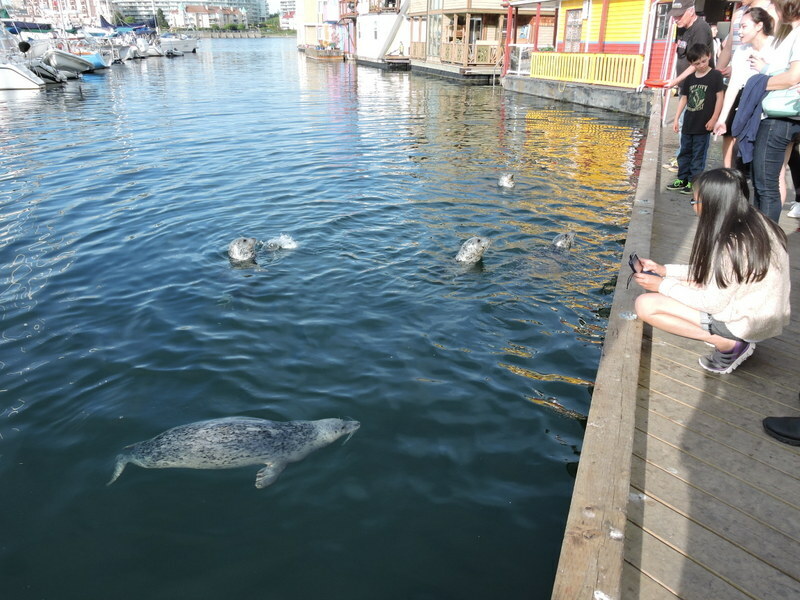 After we finish our oysters, we share an order of fish & chips from Barb’s Fish & Chips, which we also eat at the picnic table while we watch the antics of the harbor seals. Then Mike & I walk through the marina looking at the working fishing boats, and stroll around the Floating Home Village. The eclectic houseboats are fascinating! After dinner we walk back along the Inner Harbour waterfront. 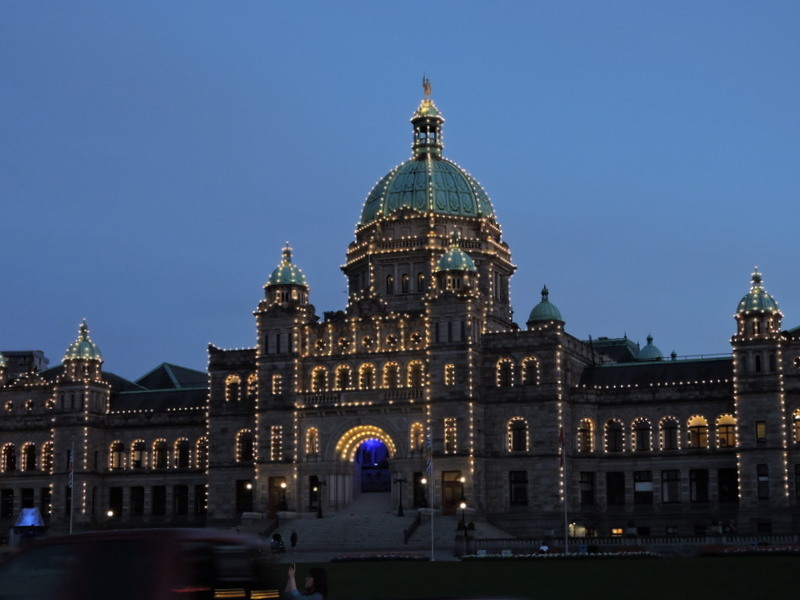 The sunset is so pretty and the British Columbia Parliament Building is all lit up. This entry was posted in Alaska Journey, Canada on May 28, 2016 by admin.